After our action packed trip to the U.S. last year, we decided that this year we wanted to mix things up a bit and have some serious downtime. Last year was a massive year for all of us, across all fronts, and we were pretty exhausted by the end of it. 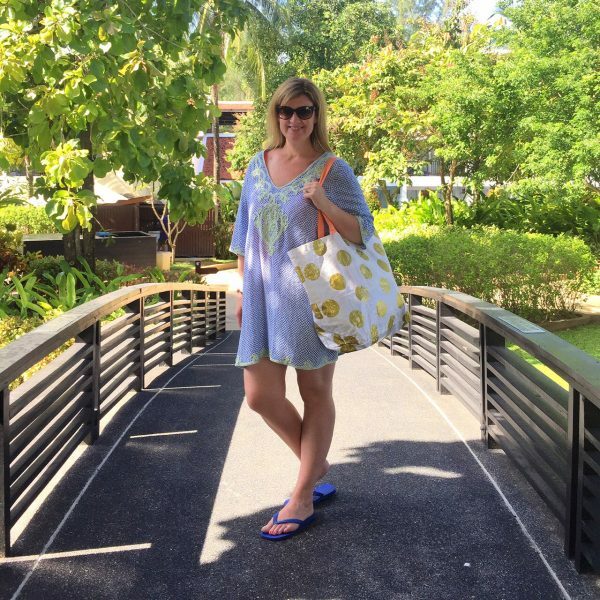 We do love a resort holiday, having loved our stays in Fiji and Bali in previous years, but, we decided we’d like to try somewhere different. Somewhere new for us. With our three boys almost 10, 8 and 5, we also felt that distance was no longer an issue. Travelling to the U.S. last year gave us the confidence that we could pretty much take them anywhere and that we were no longer restricted by the need to make the travel/flight time as short as possible. 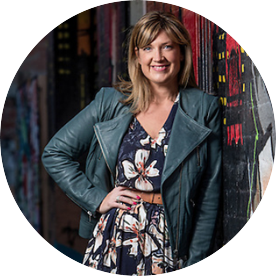 With a few trips under their belt too, they are all terrific flyers and miraculously seem unaffected by the airports, jetlag and new environments – the opportunity of uninterrupted screen time is a powerful drug! In the end, we looked seriously at Vietnam, Malaysia, Hawaii and Thailand. 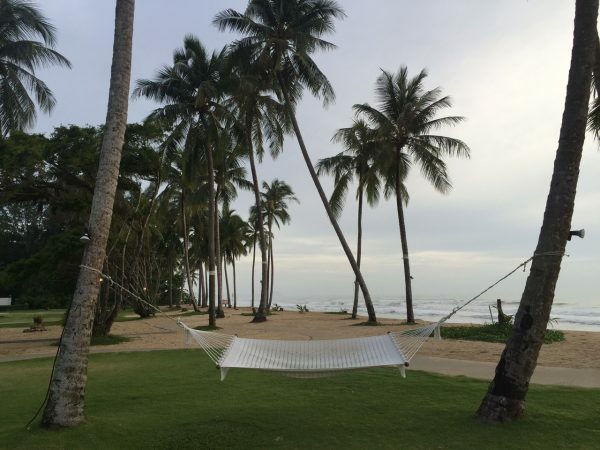 The cost of airfares for a family of 5 ruled out Vietnam and Malaysia in June/July and we found much more competitively priced airfares on Jetstar for Hawaii and Thailand for the same time of year. 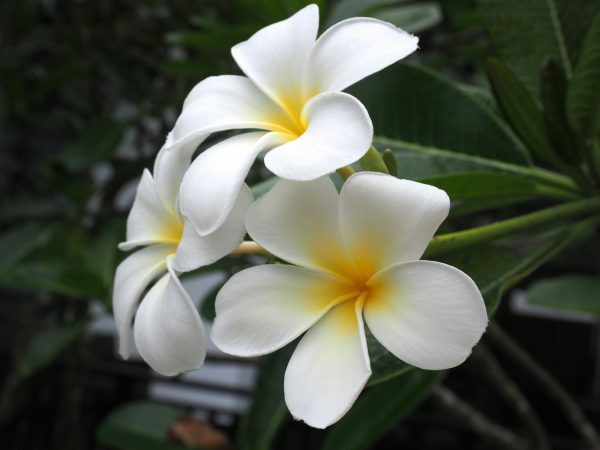 Once we’d narrowed it down, the comparative cost of accommodation in Hawaii as opposed to Thailand made the choice for us. 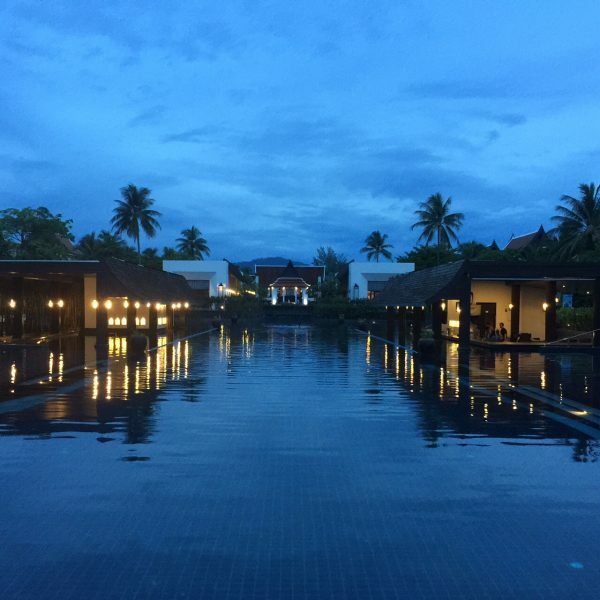 We also paid less to fly on certain dates, so in the end our trip was 16 nights long – our longest resort holiday ever – but this was manageable given Mr SnS and I can work anywhere. We did plan from the outset though to stay in different places given the length of the holiday. 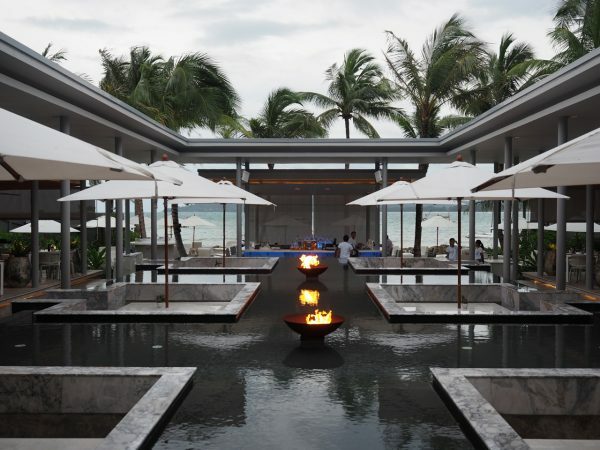 So we booked our return tickets to Phuket and started planning. 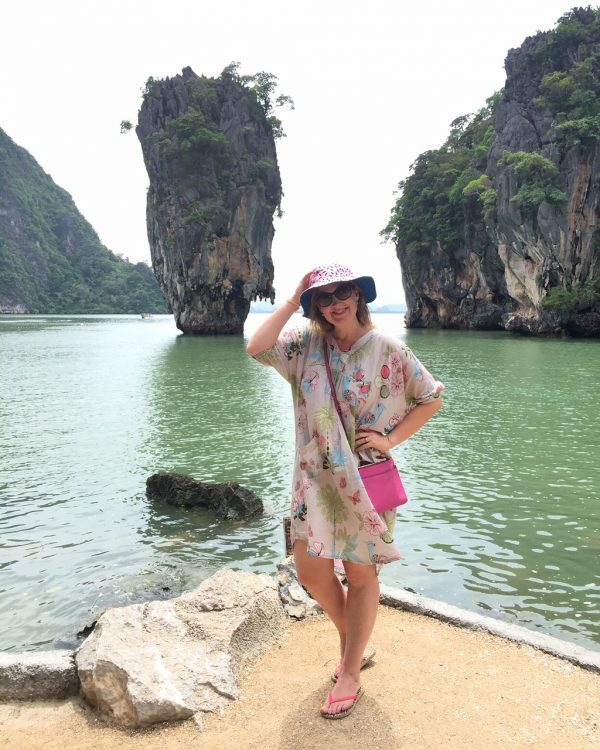 I’ve never been to Thailand, so I was super excited. In this post, I’m sharing all our intel for where we stayed, what we did and what we loved about Thailand. 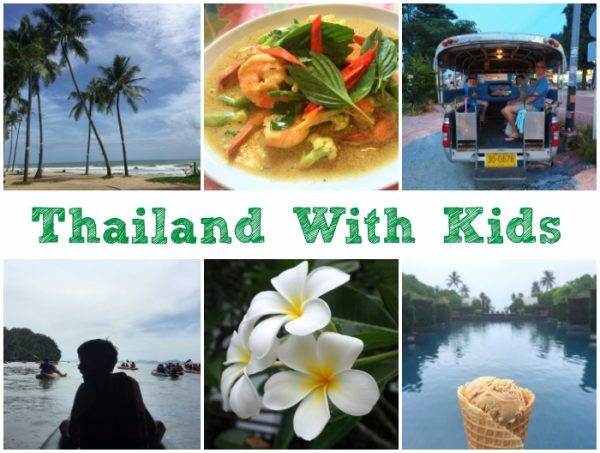 If you’re planning a family holiday to Thailand, I hope this guide helps you’re planning. 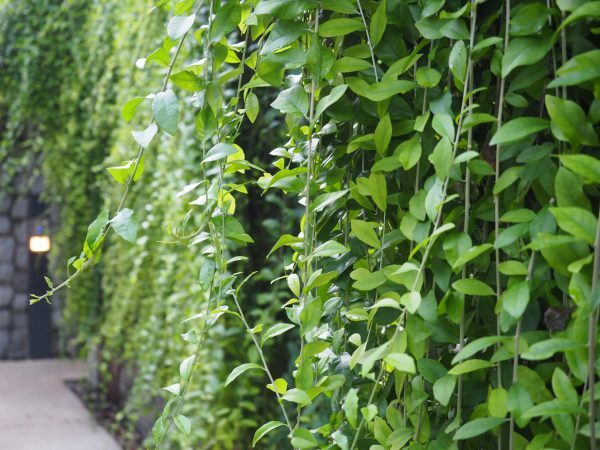 If you’ve been before, we’d love to hear your tips and traps in the comments below. 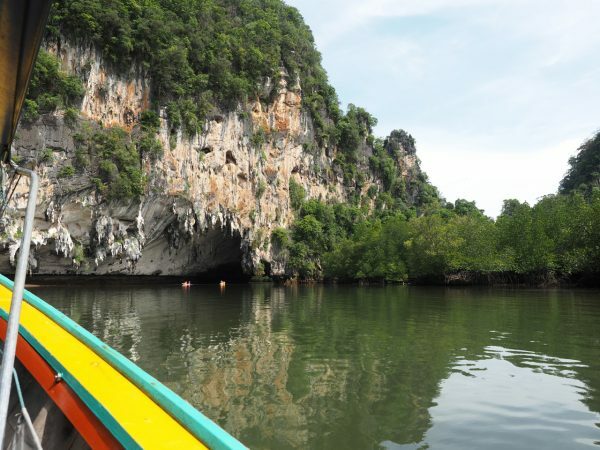 If like us, you’d like to go somewhere warm to escape the Australian winter, Thailand is an excellent bet. The only thing is, it’s the wet or low season in some parts of Thailand (including Phuket and Khao Lak) during this time. The high/dry season runs from October – March. It’s much rainier during the low season but June’s average rainfall is apparently less than other months. When it rains, it tends to set in too. 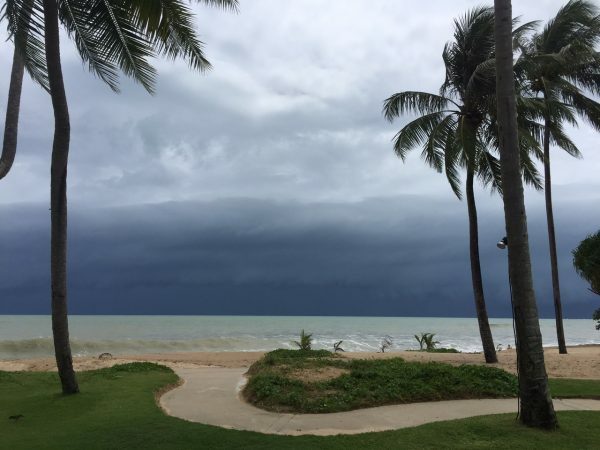 Of the sixteen days we spent in Thailand, we had about 5 completely rain free days but even on those days, it had rained overnight. On several days it rained all morning (torrential rain, not showers) but once it cleared, it was then fine all afternoon. We had two days of torrential rain all day, one of which wasn’t a bad thing as we were recovering from a big day at Splash Jungle. We still managed a solid 3 to 5 hours of pool time on the wet days. It was pretty overcast most of the time though with the sun breaking through occasionally. It was still beautiful and warm though and we didn’t really skip a beat. The bonus of the low season was that it was not busy anywhere and we didn’t really have to queue up or wait for anything. The downside, beside the rain, was that the beaches were a bit treacherous, with choppy seas and rips. As a result, we didn’t venture out to Phi Phi Island or swim at the beach. We were told the sea was too rough to cross, the visibility for snorkelling would also be low and the water too rough to swim in. 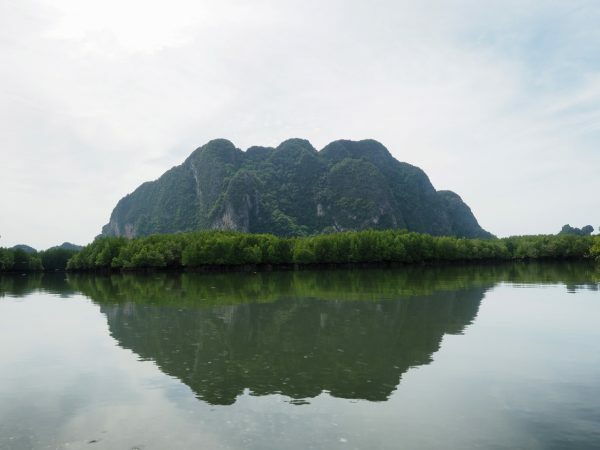 We did manage to head out to James Bond Island from Khao Lak though, but more on that below. 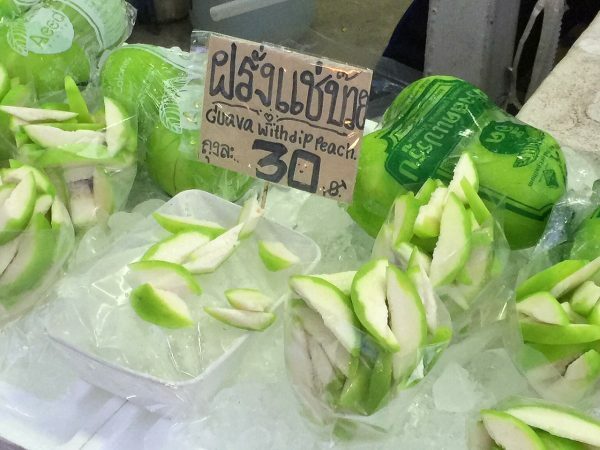 The high season is from November to March but with it comes more people and higher prices. You’ll be guaranteed dry weather but the heat is intense. 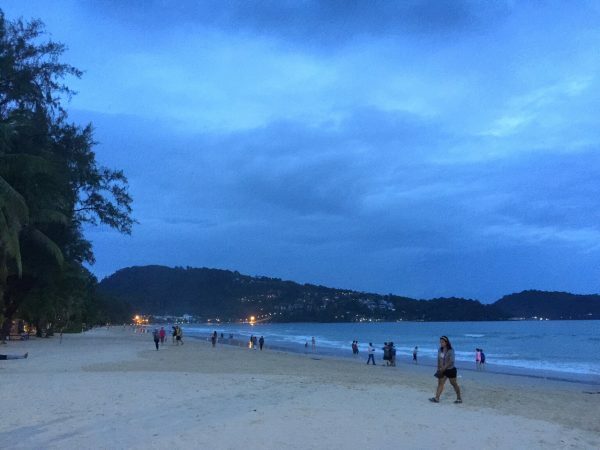 In Phuket, we stayed in the beach side village of Surin Beach, a half hour drive (at night) from Phuket airport. 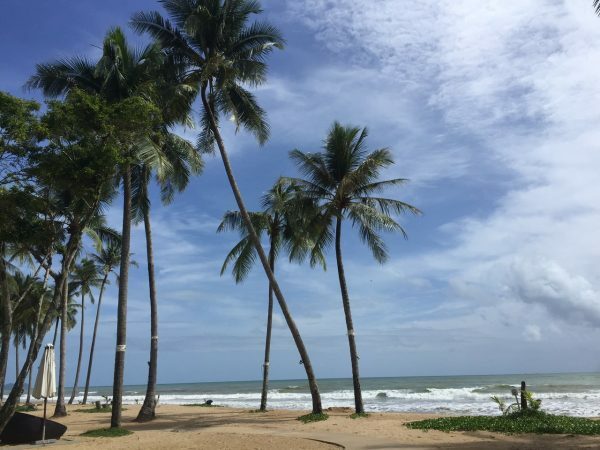 Surin Beach is situated on the west coast of Phuket, and is a twenty minute drive from the bustling town of Patong. 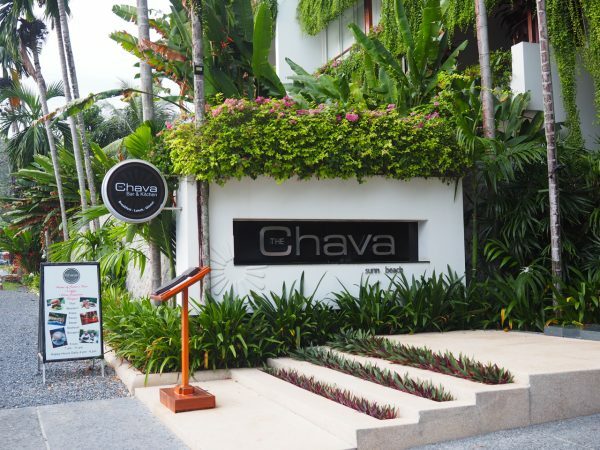 In Surin Beach, we stayed at the Chava Resort, a small boutique style resort with spacious self contained apartments. We had a really comfortable stay here and loved our spacious apartment (the deluxe two bedroom) which consisted of two bathrooms one of which had the most enormous bath I’ve ever seen, two bedrooms (we asked for an extra bed for the second bedroom instead of paying for a three bedroom apartment), a full kitchen, an open plan kitchen/living/dining area with a fridge and washing machine and a decent sized balcony with outdoor furniture. 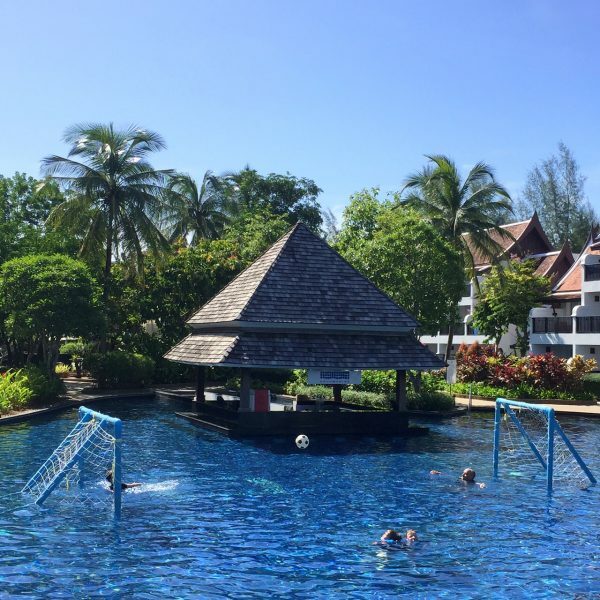 It’s quite a small resort with one communal pool (although some of the ground floor apartments have private plunge pools), but it packs a punch with it’s beautifully landscaped outdoor area with plenty of sun beds, three sun huts, cafe nearby and toilets. The cafe is open all day every day and we had our breakfast there everyday as it was included in our package. It’s not a buffet but you can order what you like from the menu. The coffee was pretty good too. We really liked the Chava and found it peaceful and relaxing. That said, it was quiet while we were there, with a maximum of maybe ten other people in the pool at the same time as us at anyone one time. 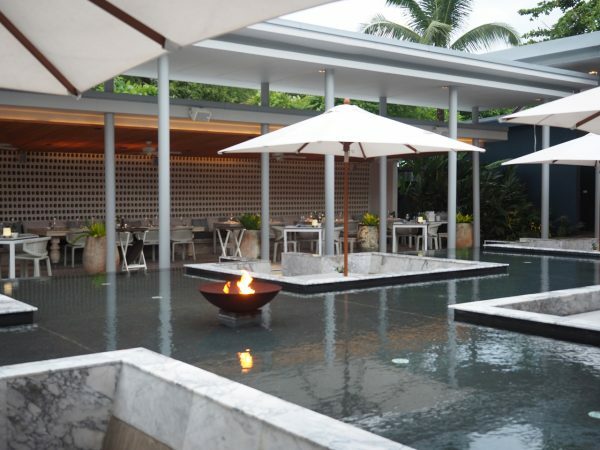 The service was friendly and helpful but a lack of attention to detail at times let things down – dishes left by the pool after lunch; soap and other supplies not being restocked by house keeping. Not a big deal of course and it didn’t stop us from having a great time. On the upside, the staff were always pleasant, helpful and unobtrusive. Plenty of information about local restaurants and activities was also provided which was great. There’s an extensive and free library of DVDs for wet days too. 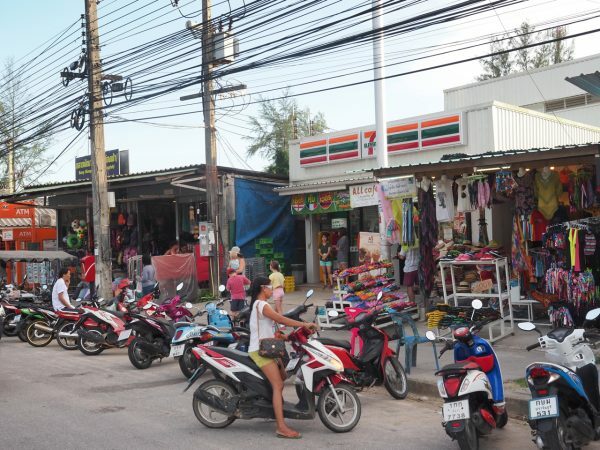 In terms of the location, there were plenty of cafes, beauty/massage shops and clothing shops nearby including the ubiquitous 7 Eleven where we bought some lunch supplies (bread, butter, spreads) and ice creams. We were warned that the beach across the road had treacherous rips so we didn’t venture there and we were also disappointed to find that the many restaurants along the beach had been recently demolished by the government. 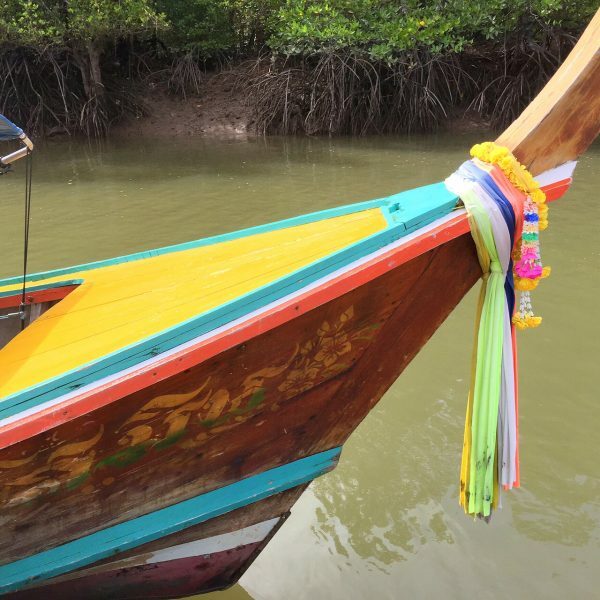 We found a similar story also in Khao Lak. 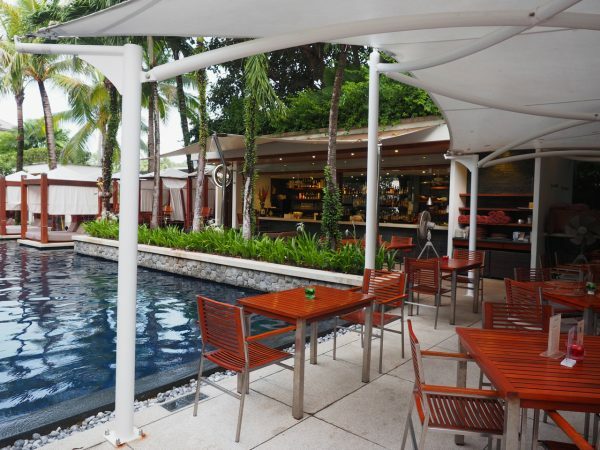 Nearby, we found the beautiful and more up market Twin Palms Phuket (we had a lovely but relatively expensive meal there one night) and next door to the Chava is the Novotel. Overall, I thought the Chava was great value and was well located. I’d definitely recommend it. 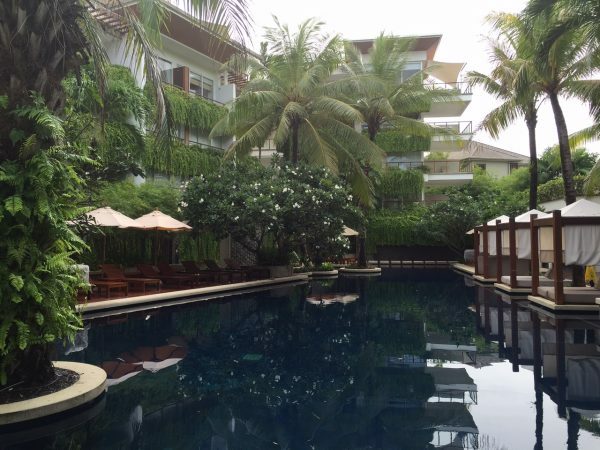 The reason we went to Thailand was to have a relaxing time so we spent most of our days by the pool. We probably should have packed some water toys – balls, floatation devices and so on – but our kids managed to amuse each other and make friends which kept them entertained for hours. 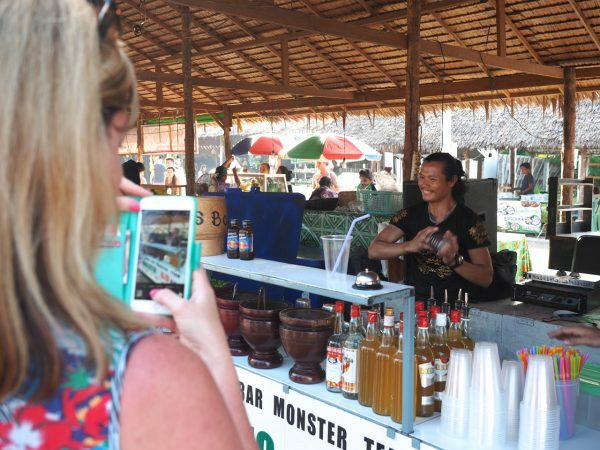 There are plenty of markets around so make sure you ask when you check in. Several of them operate in different locations on different nights while others run several times a week. 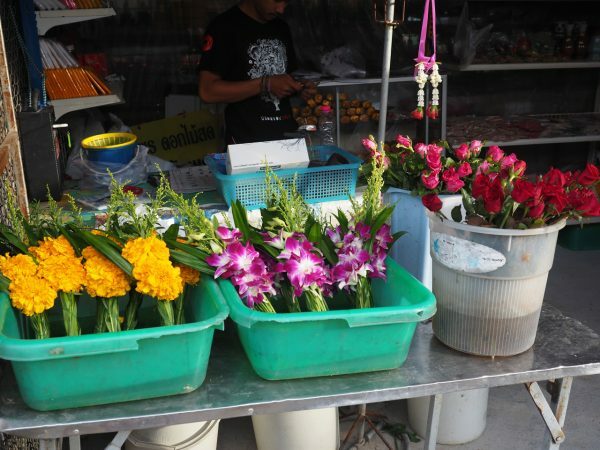 We went to the weekend markets in Phuket Town, a half an hour drive from Surin Beach. This was quite a large covered market full of clothing, DVDs, foot wear and toys plus a large food section. 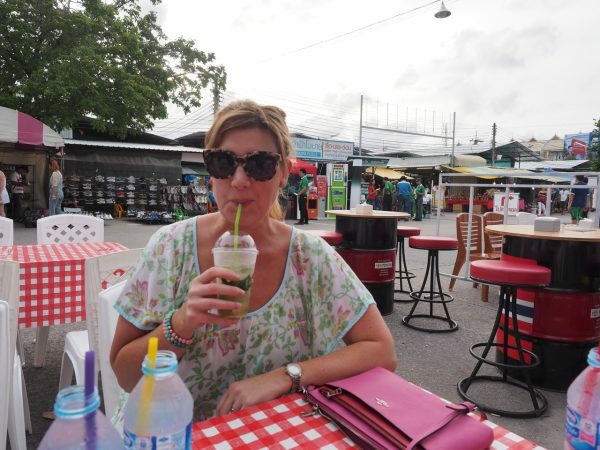 We arrived around 5pm to wander through the markets before we had dinner nearby. 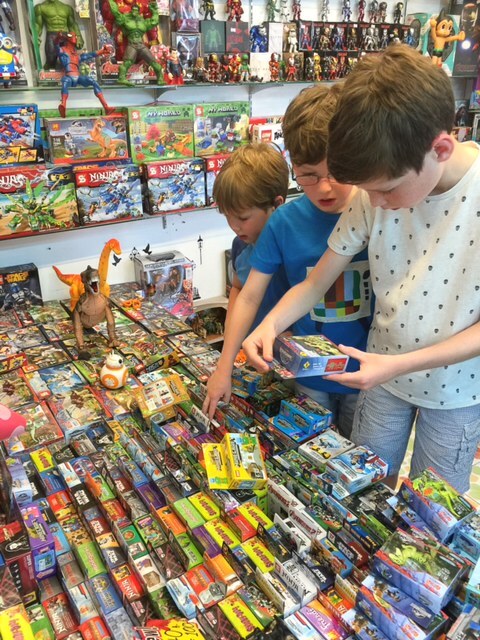 Despite complaining about the prospect of going shopping, the kids loved the toy stalls where we gave them a few dollars each to buy some faux Lego. 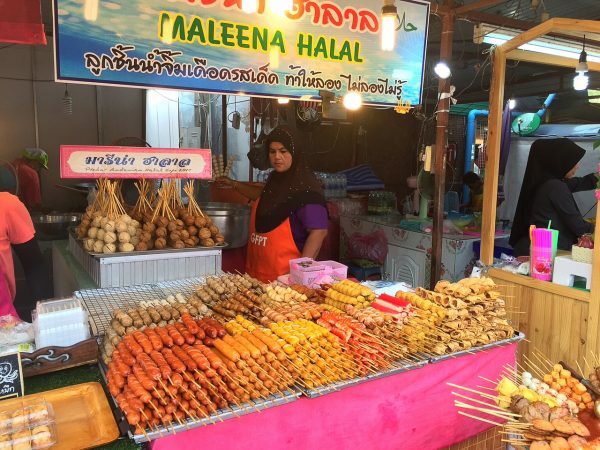 The clothing and footwear didn’t really appeal to me (mostly thongs and slogan tees) but I did love the food stalls. 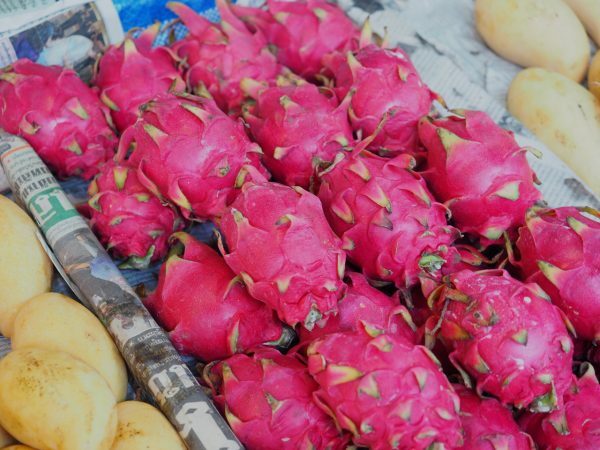 So much amazing produce, it was a visual feast. After the market, we walked across the road for dinner. I took it upon myself to road test all the mojitos. Loved how this one came with a lid – always helpful around the kids! 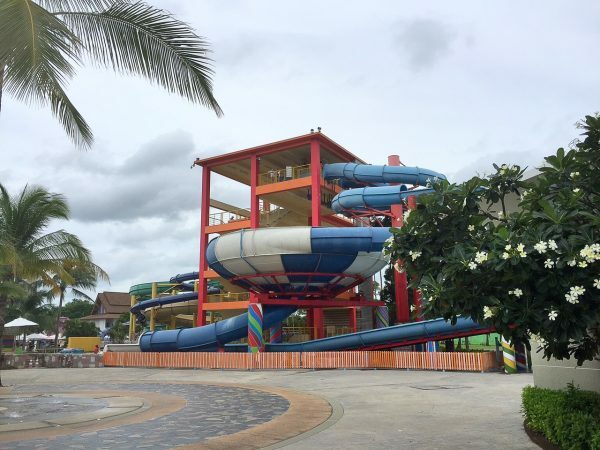 Splash Jungle is a water park in the same vein as Bali’s Water Bom park or Queensland’s Wet and Wild but much smaller. It was reasonably maintained but not at quite the same level as Water Bom. It’s not an inexpensive day out though. It costs us $120 entry plus the cost of getting to and fro (another $60). We easily spent half a day here though and had a very fun time, despite my terrifying ride on the Boomeranga, below. I thought for a minute there we were going to shoot off the edge! There’s one tube ride, two free water slides (open and closed), the Boomeranga and the Super Bowl. 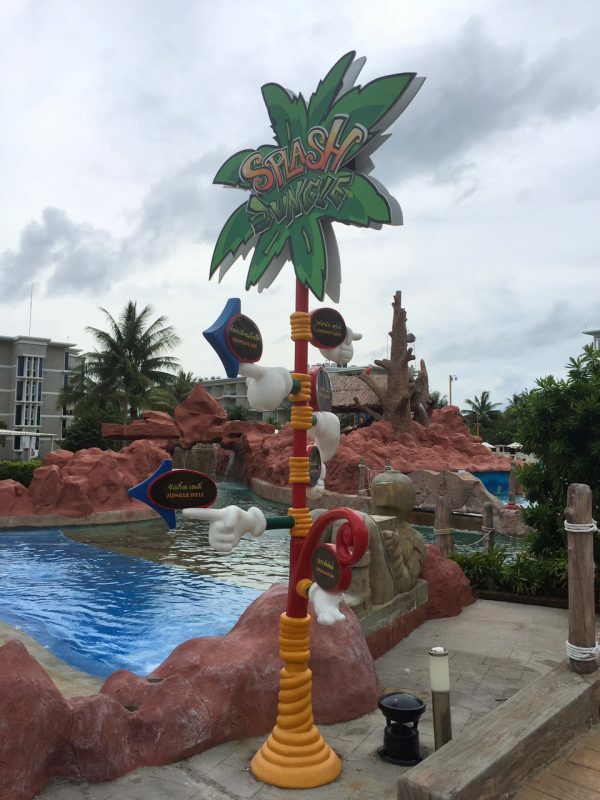 For the young ones, there’s a large fantastic water play area. There’s a swim up bar for the adults and the relaxing Lazy River when you need some downtime. You can also hire towels on site but you can’t take any food in. 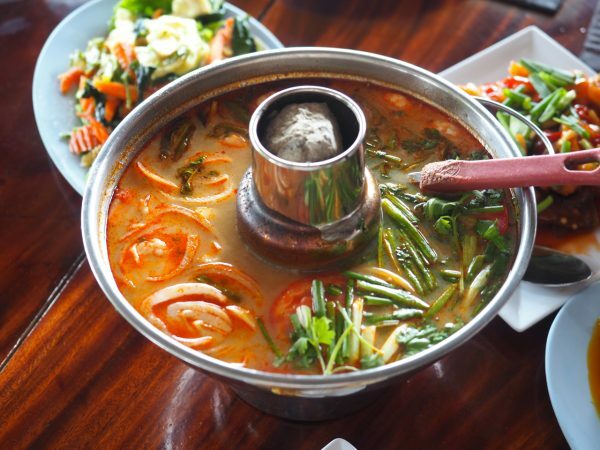 There are plenty of great places to eat locally, but sometimes, it’s nice to venture a little bit further afield for something a little bit different. 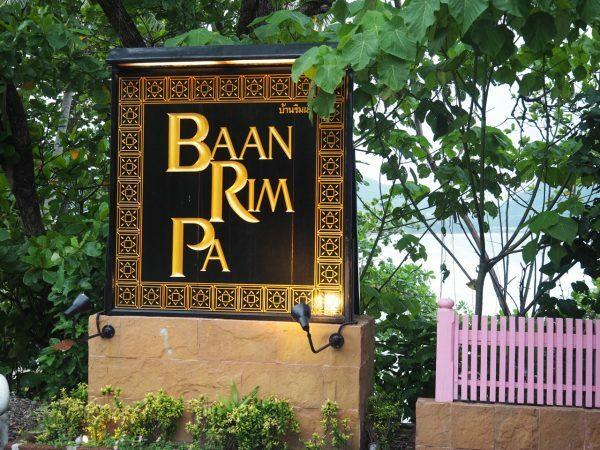 We had a lovely meal at the popular and traditional styled Baan Rim Pa on the cliff overlooking Patong beach. The food here was on the fine dining end of the spectrum within a traditional setting. 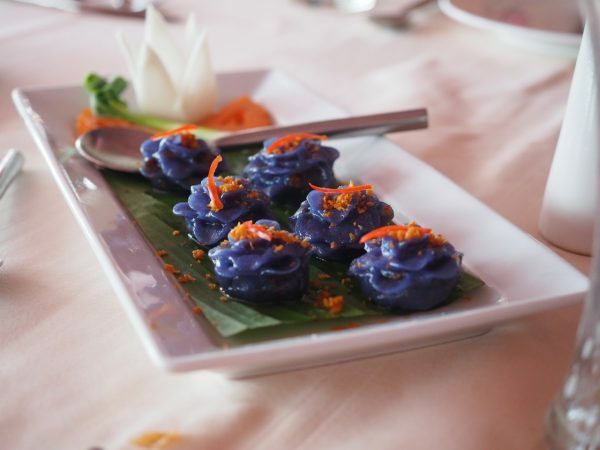 We ate traditional entrees (spring roll, satay skewers) and the delicious crab and chicken dumplings, below. The kids inhaled the BBQ pork while Mr SnS loved the spicy richness of their yellow chicken curry. This wasn’t an inexpensive meal but a lovely dinner before we went down the hill to visit nearby Patong. 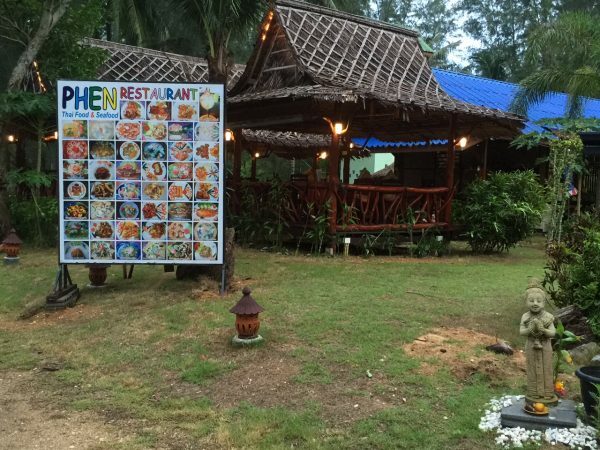 We also had a great meal – our best in Phuket – at The Palms Seafood Restaurant in nearby Choeny Thale, a five minute drive from Surin Beach. 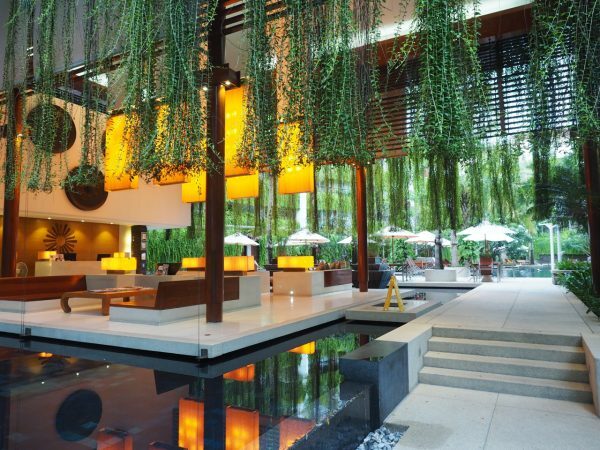 This is a stunning restaurant with an impressive interior design and fit out. There’s also a lounge on the beach at the back, next to the bar and a DJ on the decks for in between times too. 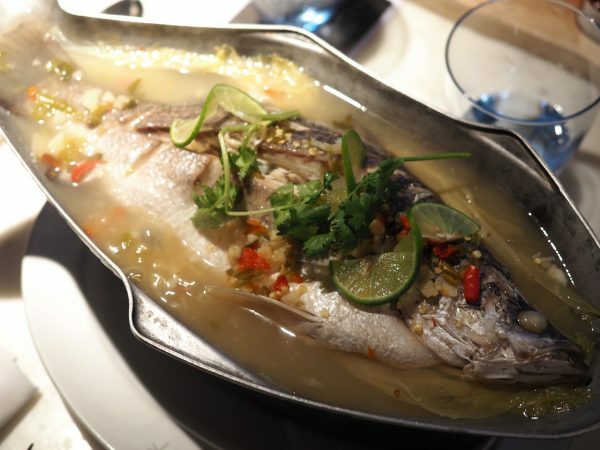 For dinner, we ordered the White Snapper with lime and chilli, Tamarind prawns and stir fried veggies. Everything was fresh and delicious. 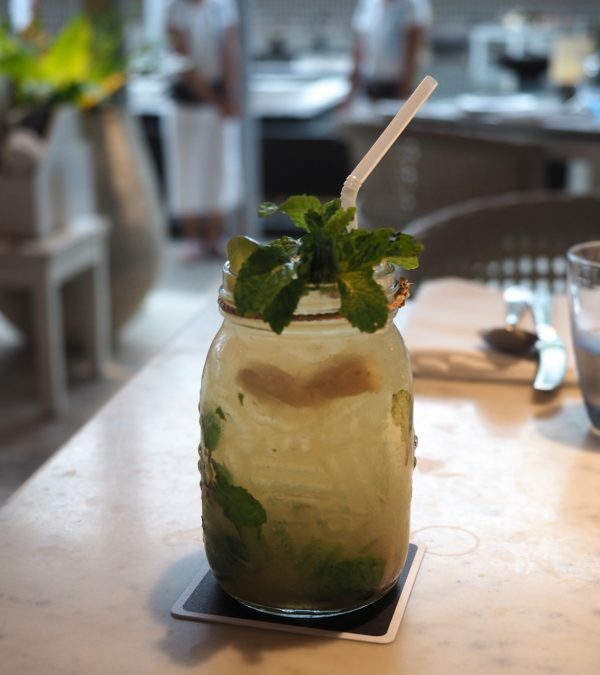 The mojitos, including their signature ginger mojito, were all excellent too. 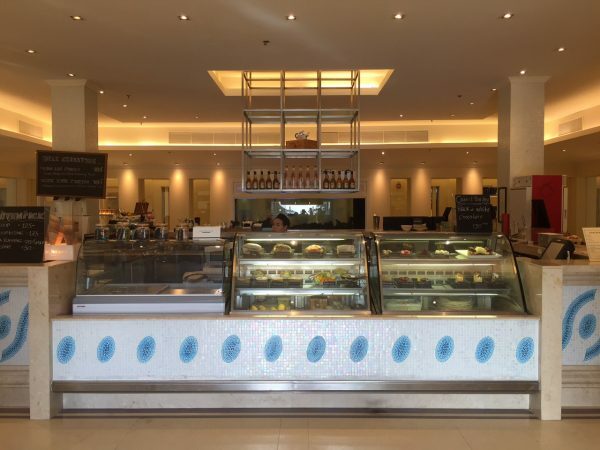 With an amazing fit out and beautiful food, this is a must visit for foodies and design enthusiasts. 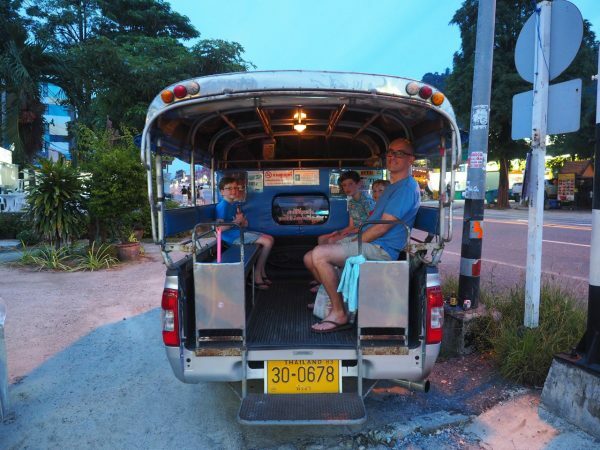 Oh and when we booked our reservation through our resort’s reception, our transfers were included – that’s right, they collected us and drove us home at no additional charge. 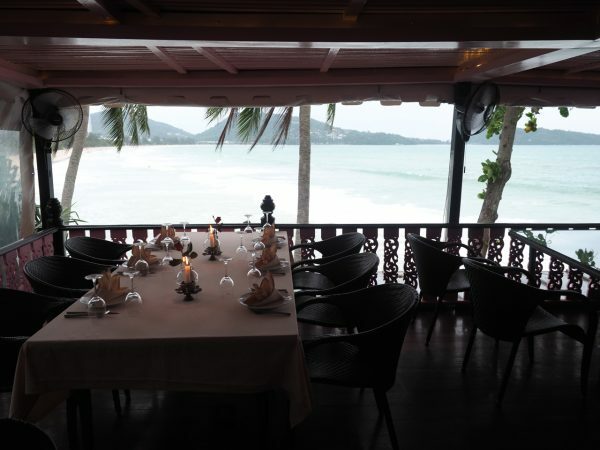 That said, the meal was our most expensive in Phuket. 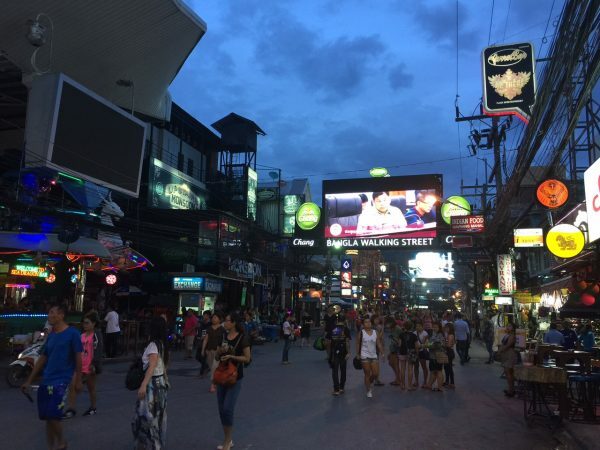 I visited Kuta in it’s hey day once but I think Bangla Road, Patong is definitely a few notches higher in the crazy town stakes. There are loads of bars (with tell tale poles for later in the evening), 7Elevens, tourist shops, eateries, massage parlours and so on. The kids were oblivious to most of it thankfully. At the end of the street is the patrolled beach though, which stretches for miles and has impressive views. I wouldn’t want to stay in the thick of it but it’s worth checking out and there’s plenty going on if you’re looking for some night life. 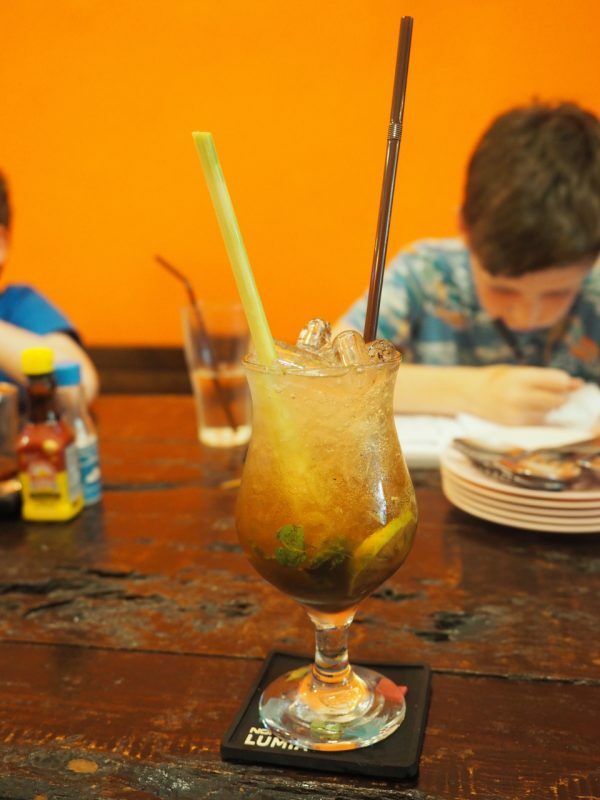 The kids tended to gravitate to the western options (every cafe has french fries on the menu) but we made it our mission to try as many Thai dishes in as many local places as possible. 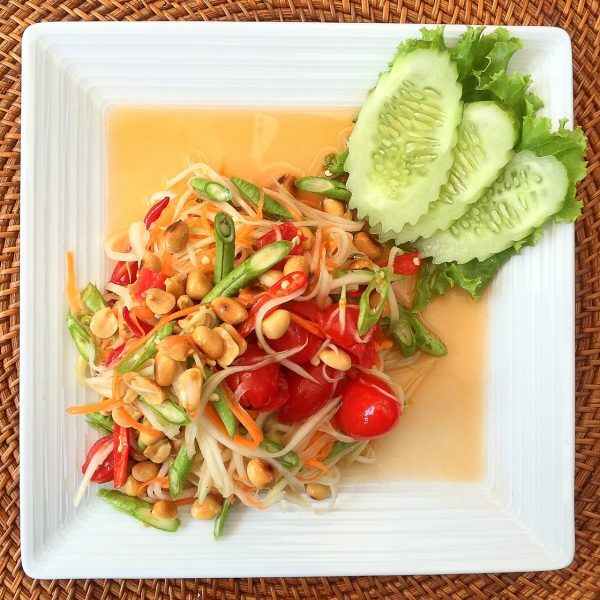 Below is the a green papaya salad from The Chava’s cafe. 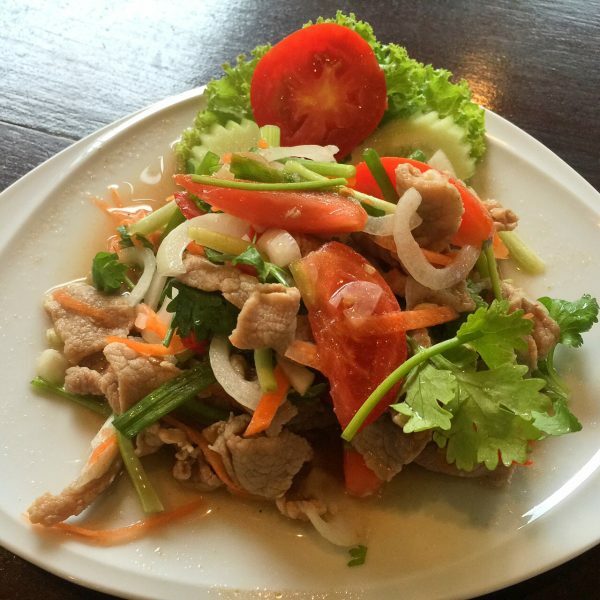 There’s so much variety in Thai cuisine that it didn’t seem repetitive and even small, local cafes had pages and pages of options. 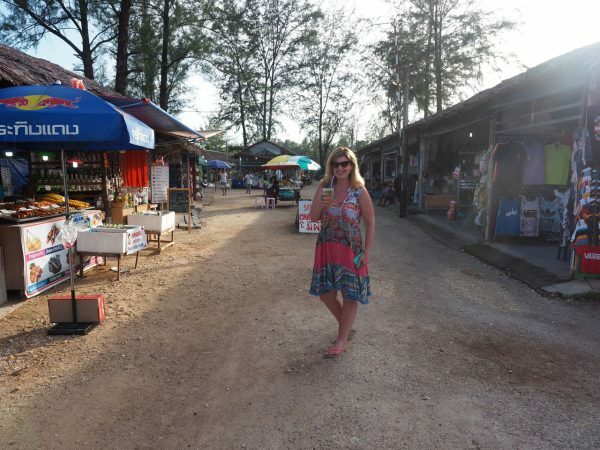 We were surprised to find that it’s not particularly cheap to get around Phuket. You can’t really bargain with taxi drivers and there are no taxi meters. All the fares are set. Despite this, we did manage to negotiate sometimes. 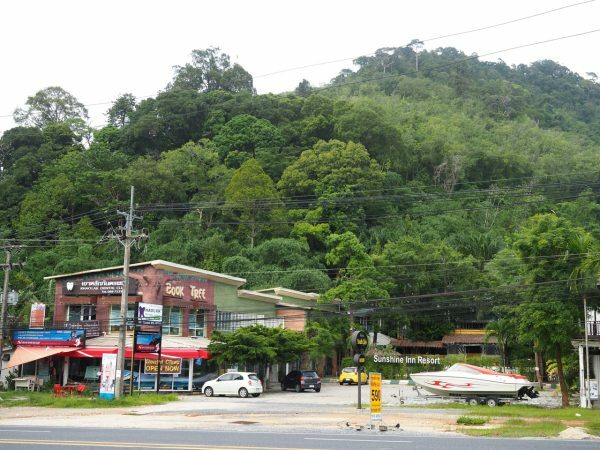 A shorter trip, say to Patong which was twenty minutes away was 300 Baht ($12) despite the rate above being 500 Baht ($20). We also managed to reduce the fares slightly when we negotiated for our driver to drive us home as well. 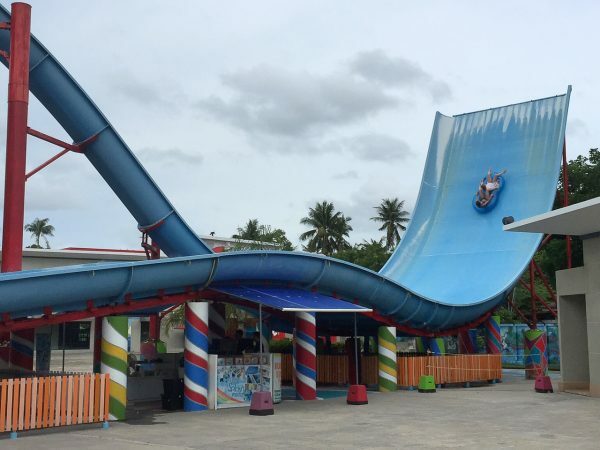 For example, it cost us 1500 Baht ($60) for the round trip to Splash Jungle (just next to Phuket airport), which was 45 minutes each way. We often opted for the open air vans, below, as there was more room for our family of 5 than a sedan for the same price. There were no seat belts though and things got a little wet when it rained. The following were recommended to us but we either ran out of time, it was raining or the kids needed some downtime. 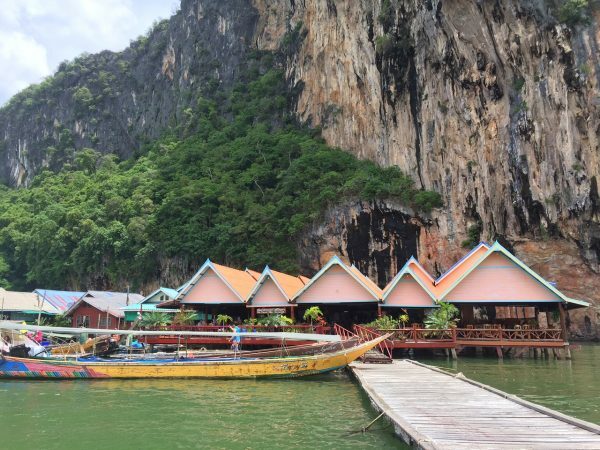 Phi Phi Island – we were disappointed to miss a trip out to this iconic island. Rough seas were to blame here – we didn’t want to risk taking the kids in choppy seas for an hour (by speed boat) when we couldn’t snorkel or play on the beach when we arrived. 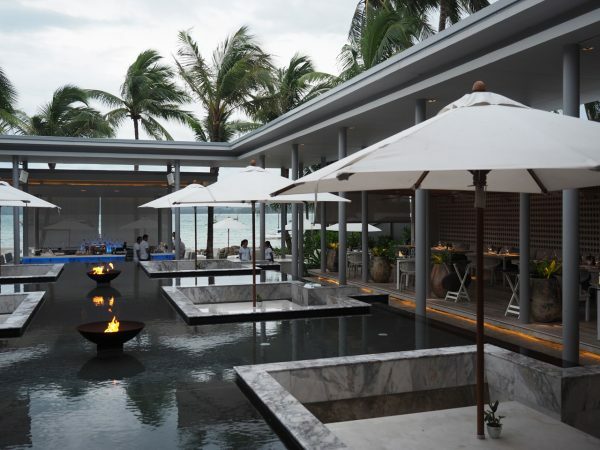 Bliss Beach Club in Bang Tao – the day we planned to go the rain was torrential. A great spot for families apparently with a big deck and kids pool. 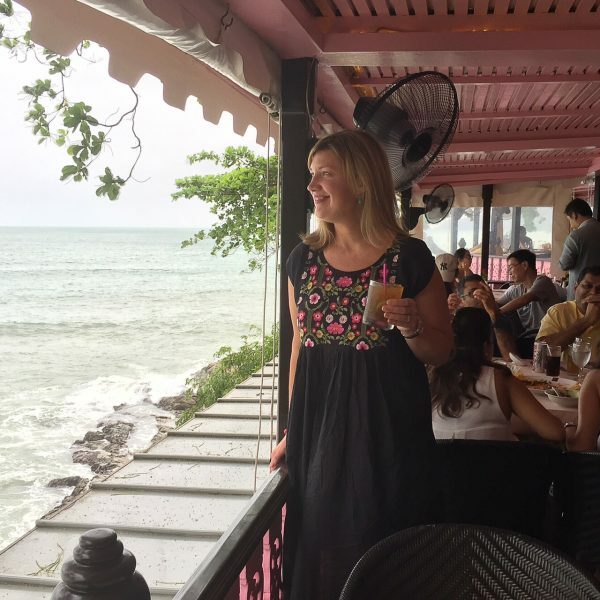 Mom Tris Grill/Boathouse Grill at Kata Beach – a girlfriend told me her meal there was in the Top Ten best meals of her life. 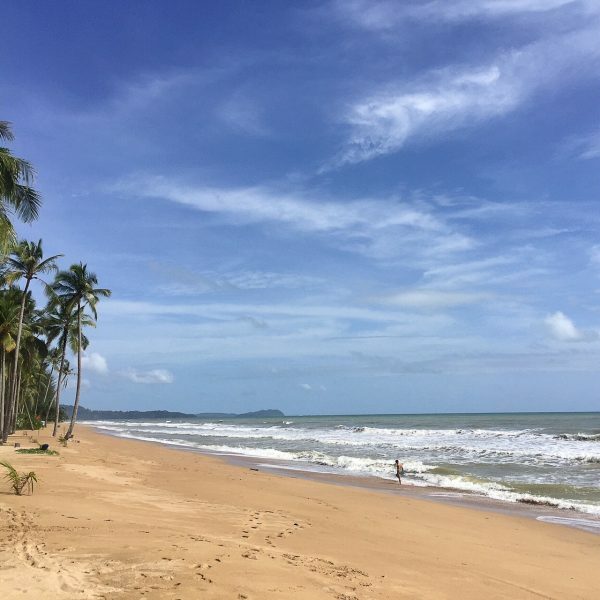 Once we’d booked our Surin Beach accommodation, we were tossing up between staying at either Koh Samui on the east coast or Khao Lak, on the west coast of the mainland, a 90 minute drive from Phuket. 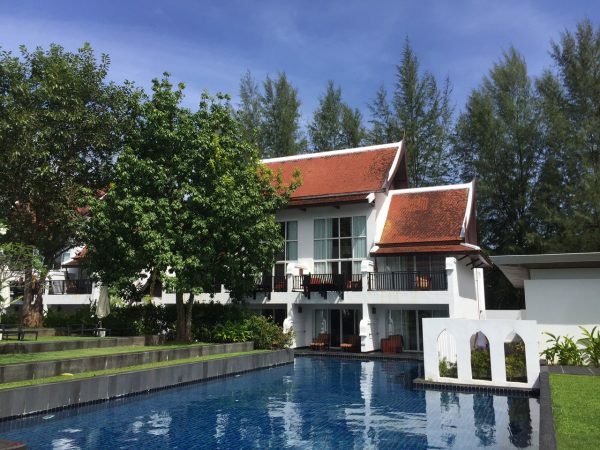 We decided to stay in Khao Lak and put the money we would have spent on the internal flights to and from Koh Samui (around $900 for the five of us) towards some nice accommodation in Khao Lak. 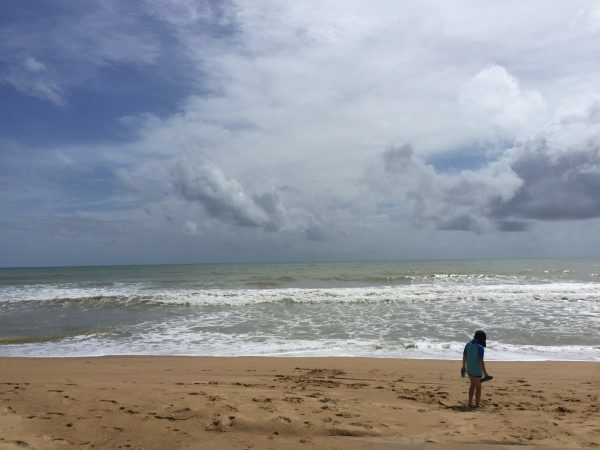 Khao Lak felt more lush, green and rural than Phuket. 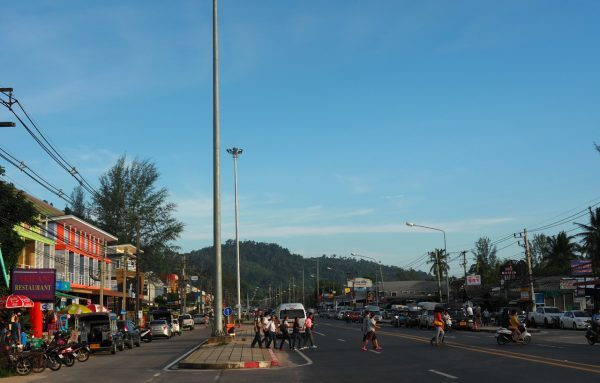 It seemed to me to be cleaner and less industrial than what we saw of Phuket too. It reminded me a lot of Fiji. 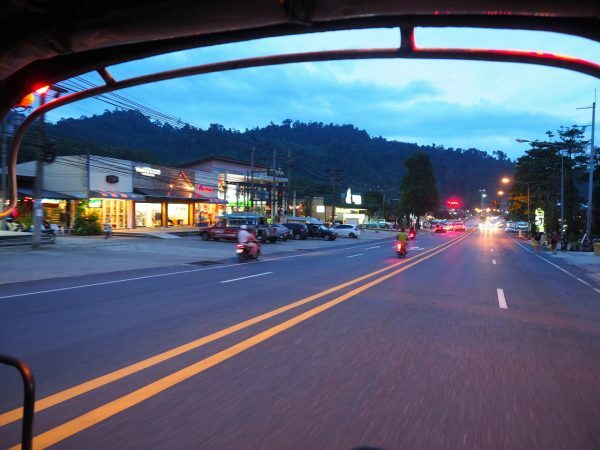 Below are some pics of the main drag of Khao Lak, taken in the daytime and early evening. We stayed at J.W. 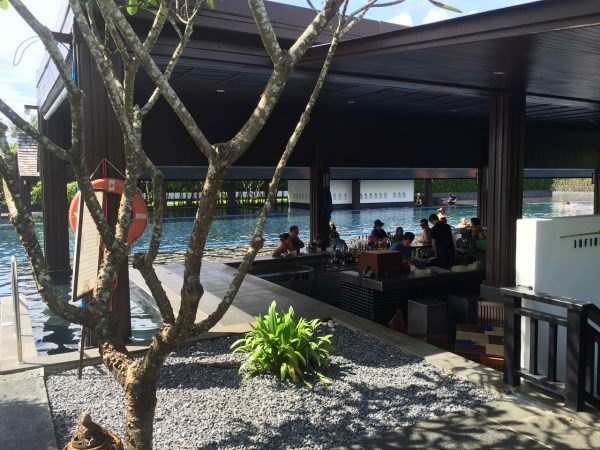 Mariott, which is a ten minute drive out of the main hub of Khao Lak, right on the beach. 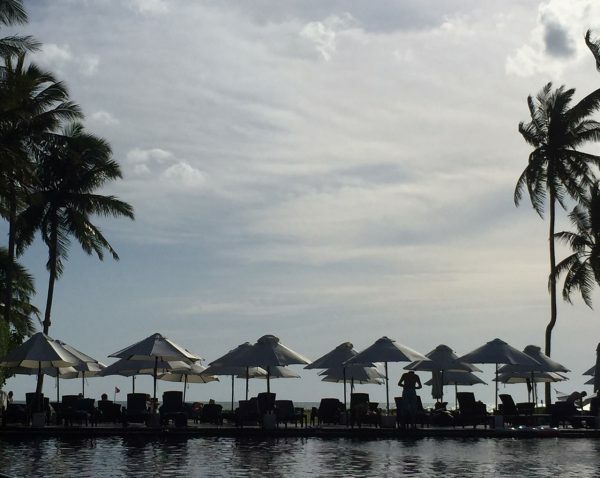 It’s set right on the beach and is a big, impressive and beautiful resort with the most enormous pool I’ve ever seen, directly opposite the beach. 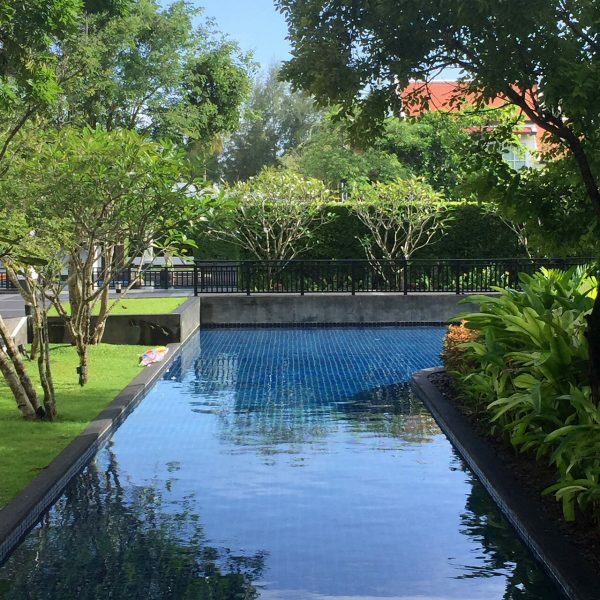 We loved endless pool which winds for over 3kms right around the property in amongst beautifully landscaped and maintained gardens. We also loved the pool bars, one in the main pool, below and one in a smaller pool near the kids’ pool. 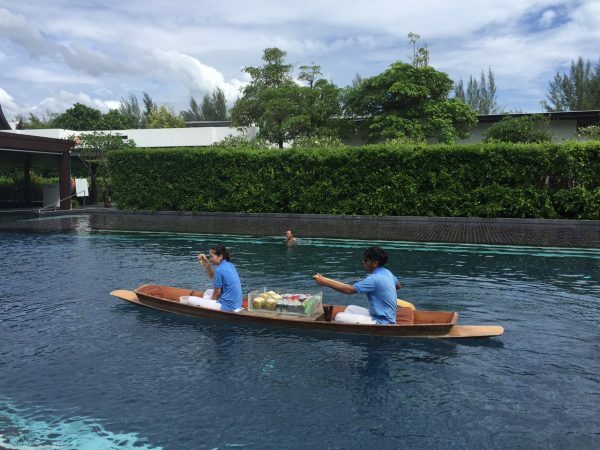 There was even a floating bar service late in the afternoons. How good is that! 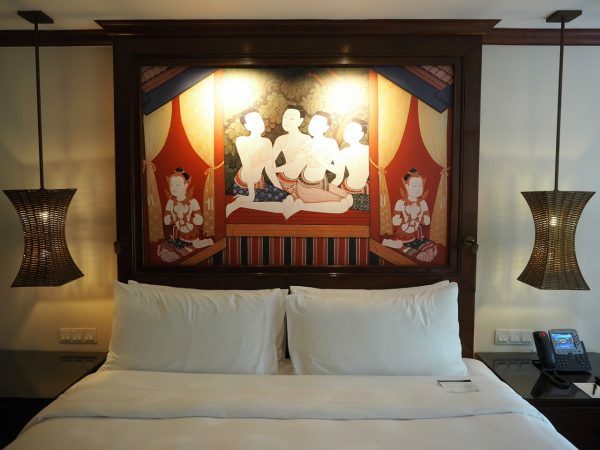 Our rooms were well appointed with big bathrooms, enormous baths, huge beds. 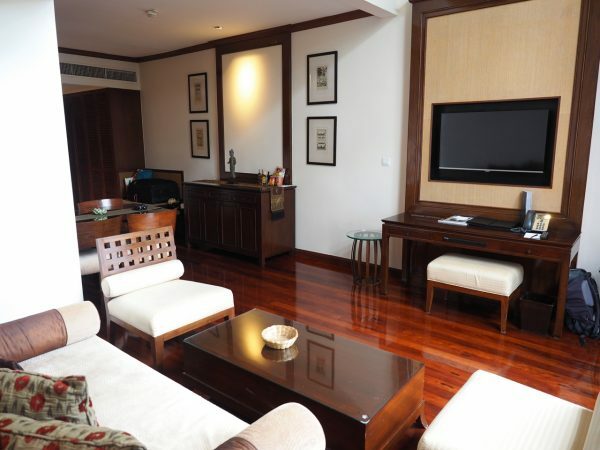 We had a two bedroom (three bathroom) suite which was effectively a room and a suite with an interconnecting door. 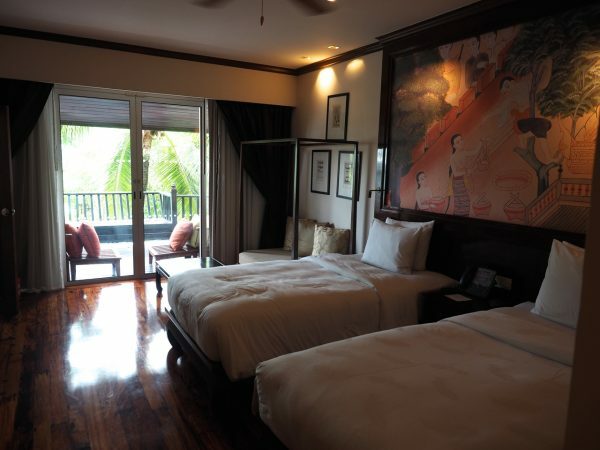 We had a living area downstairs in one room, below, with the master bedroom and a bathroom on the mezzanine level. There was a door connecting the downstairs living area with the boys’ room. The boys all shared one room with our youngest sleeping on the day bed. 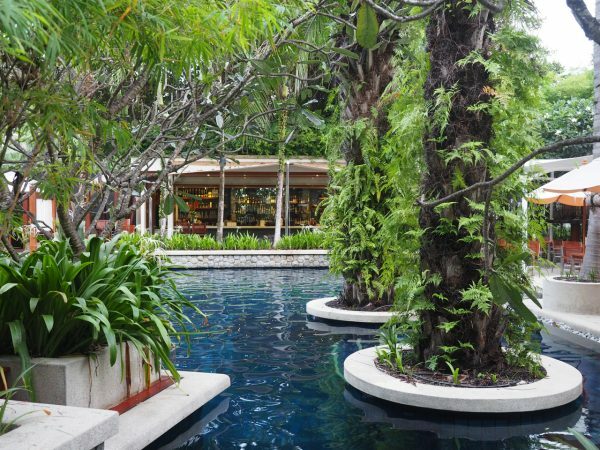 The JW almost felt like a mini city – it has it’s own night market, medical clinic, gifts shops as well as two pool/diving shops, ATMS. 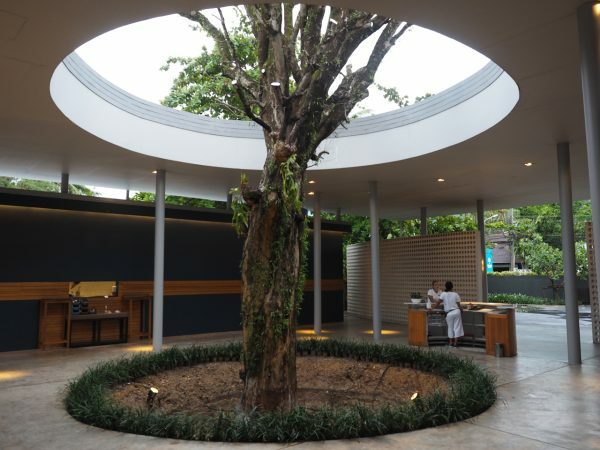 In terms of facilities, it was right up there as well with plenty of dining options – there were four restaurants on site (Japanese, Thai, Mediterranean and The Waterfront Restaurant), a deli, below, a bar, two swim up bars, not to mention the gym, group fitness room, squash court and bikes (both adults and kids’) which could be hired. 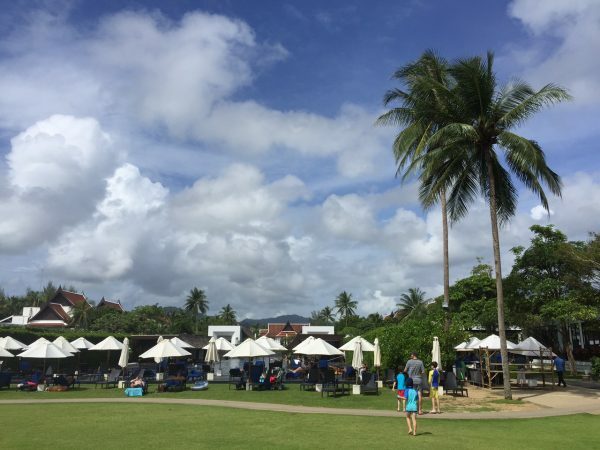 We loved that there was plenty of space for the kids, an amazing buffet breakfast, the polite and helpful staff and plenty of pools to choose from as well as the beach. There was also a kids’ club which our kids wanted to visit most days. We let them go for an hour or so some days, mostly on wet days to break things up. The usually played video games though, so we limited their visits. Craft activities were available too but were an additional fee and bookings were required the day before. There was a ping pong table near the kids club too. 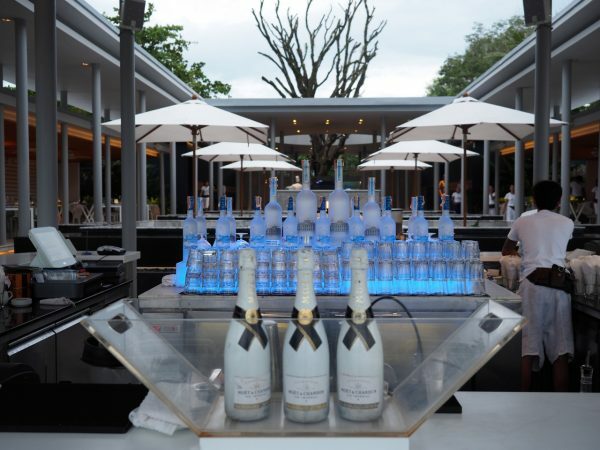 As you’d expect, eating and drinking inside the resort was super expensive – two to three times what we’d pay outside the resort – so we only ate dinner inside the resort once at the Japanese restaurant Sakurai. We had a great meal here but it was one of the most expensive meals we had. The price of cocktails during happy hour were more expensive than what we’d buy at full price elsewhere too. The resort shuttle service was a bit of a rort. A one way ticket cost 100 Baht per adult ($4) and 50 baht for kids over 5 ($2) so it cost us $12 to get a ten minute shuttle into town, the same price as a taxi (the fixed price is 300 baht). 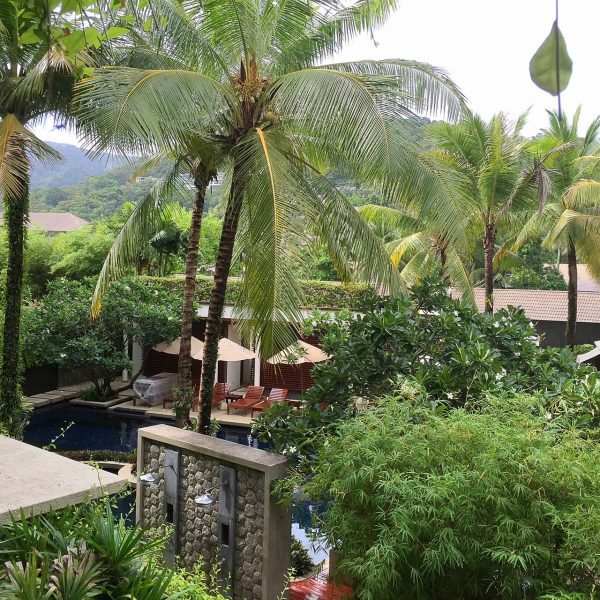 Luckily we found a great option within walking distance of our resort – more on that below. 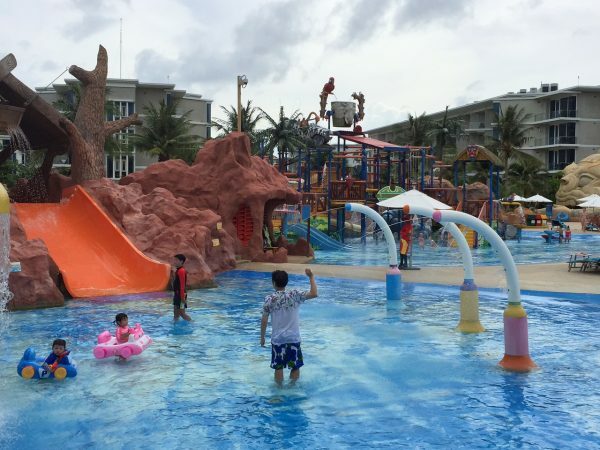 Overall, this is a beautiful resort and a great place to take the kids, especially once the kids pool re-opens (it has a water slide and is currently being renovated). It’s great for extended family groups too as everything you need is on site, provided you’re happy to pay a premium. From a price perspective, it was much more expensive than the Chava though, and it would have been easy to spend a lot more if we hadn’t found somewhere to eat outside the resort, that was within walking distance. Unfortunately, nearly all the restaurants along the beach,which had been recommended to us and reviewed favourably on Trip Advisor have been demolished recently. If you’ve visited before, Blue Mist and The Andaman Seafood Restaurant are sadly no longer there. 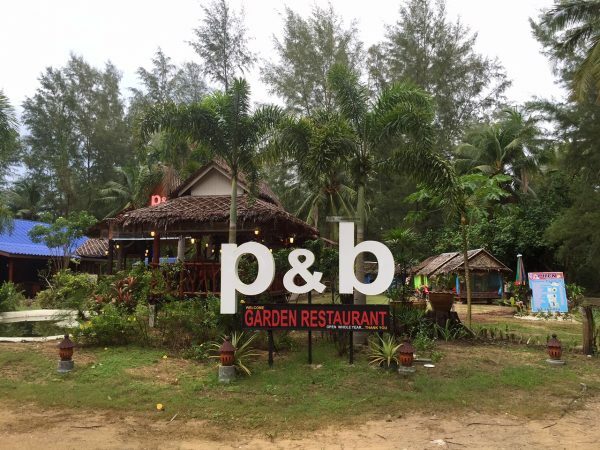 Only one remains – Phen/P&B Garden Restaurant, which is set back from the beach but well lit up. This became our home away from home. 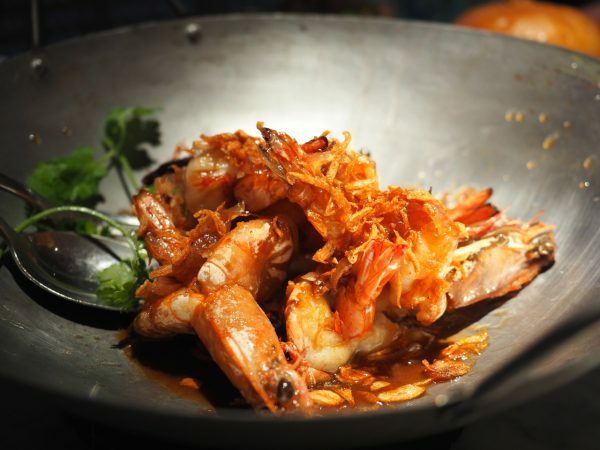 We ate like kings here – the food was fresh and delicious, the staff lovely and hospitable. 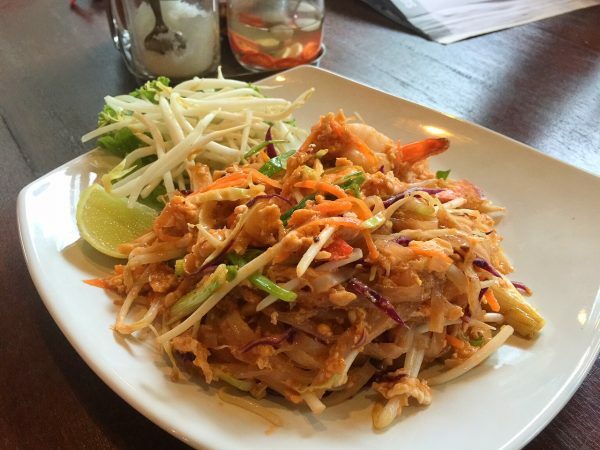 Everything we ate here was great but my favourites were the Spicy Beef Salad and Pad Thai. We usually ate two courses, and including a beer and a cocktail, our bill was usually around $30 for the 5 of us. Above, their spicy beef salad was fresh and tasty while their Pad Thai, below, was the best we had in Thailand. 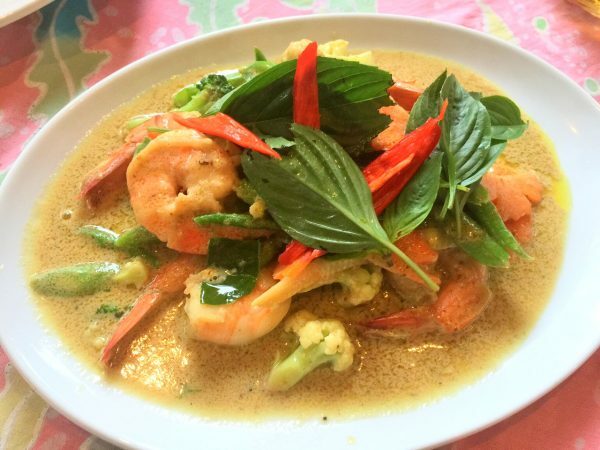 This green prawn curry was all sorts of delicious too. 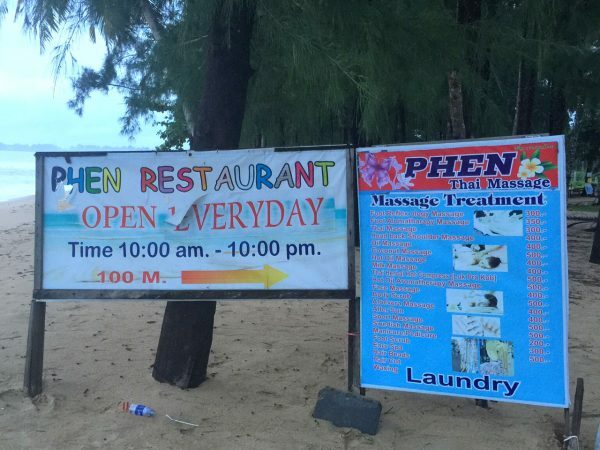 Like most establishments, they also offer a laundry and massage service. Two decent shopping bags of laundry costs us $11 to be washed and folded. Loving that. 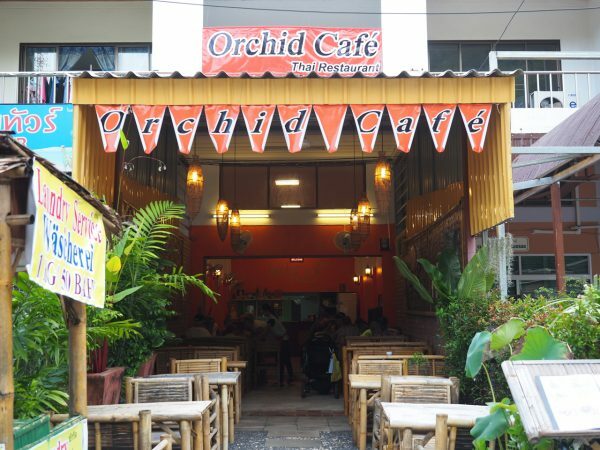 In town we loved The Orchid Cafe, which my friend Tam of My Melbourne Thermo recommended. The food here was excellent, fresh and flavoursome. 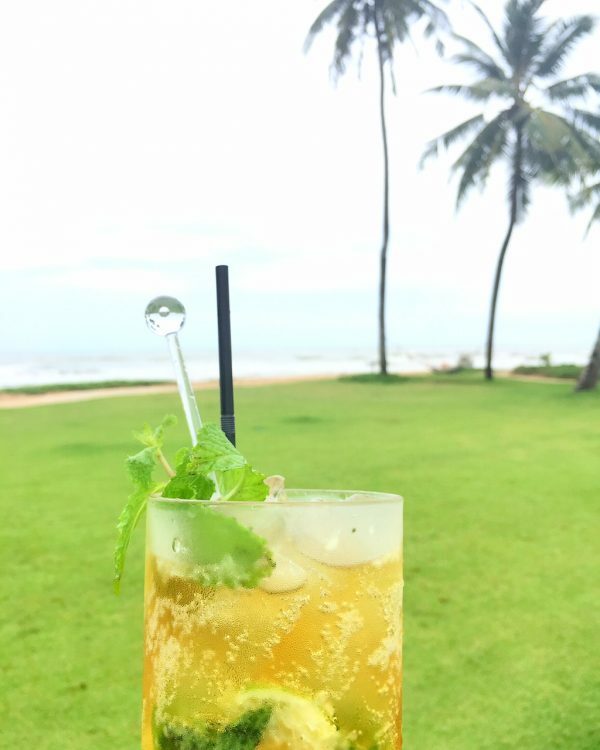 Their lemongrass mojito was also the best cocktail I had in Thailand. If it didn’t cost us $24 in taxis/shuttle to travel to and from there, we would have visited more often. It’s not to be mistaken for another, larger cafe of the same name, a bit further up the road on the opposite side. Look for the orange sign and walls. 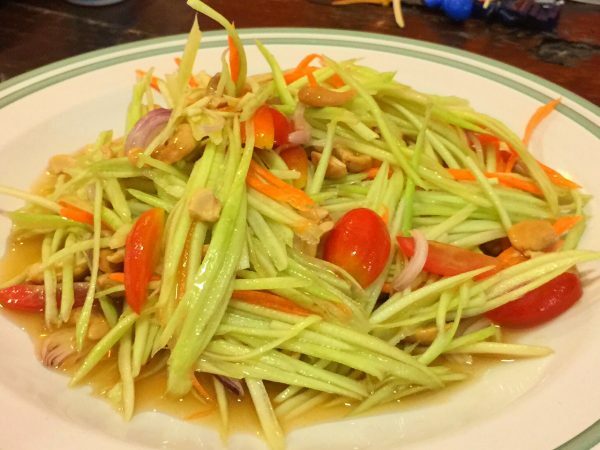 Their signature green mango salad might not look incredible, but it was on a whole other level. Just amazing. 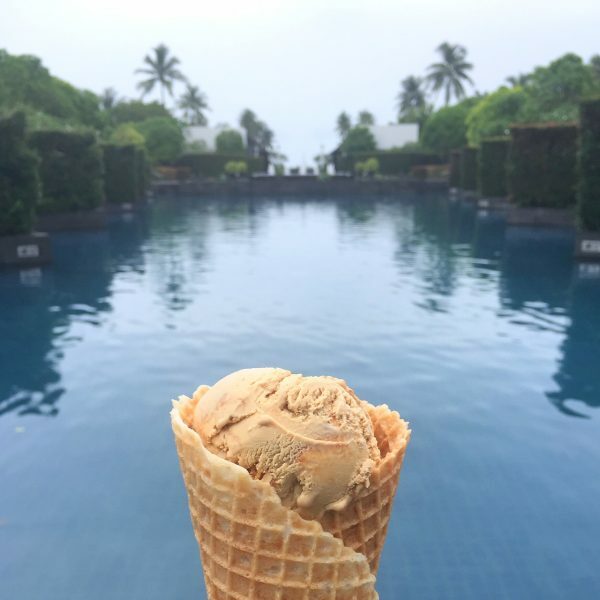 We spent most of our time in Khao Lak poolside as we had such great weather for most of our stay, but we ventured out each day for dinner and for the following outings. 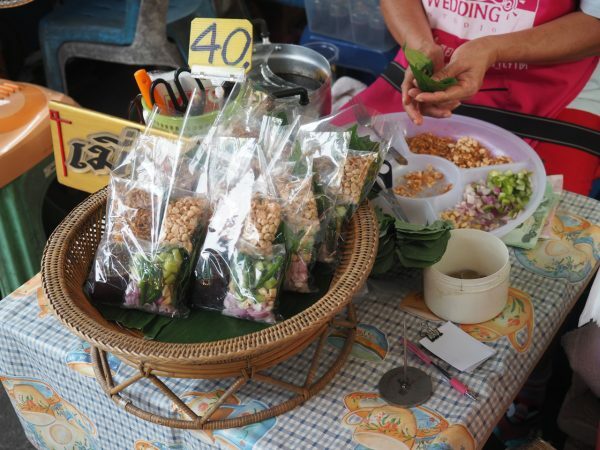 There’s a local market in town three nights a week – Saturday, Monday and Wednesday. 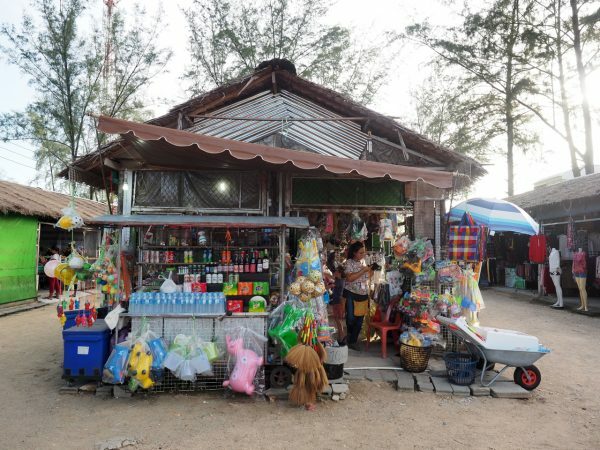 It was similar in style but much smaller than the Phuket Town market we visited the week before. 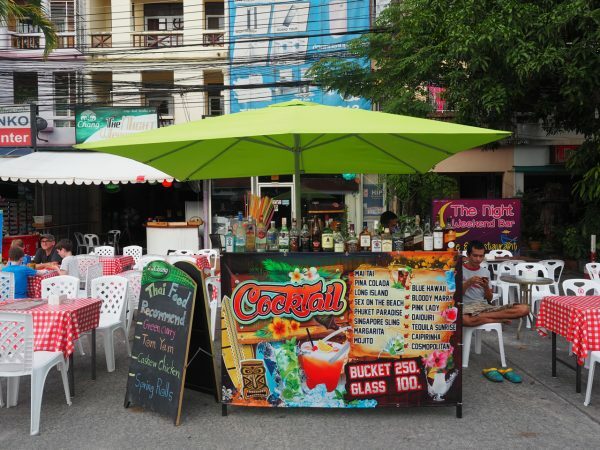 You must check out the mojito guy who loves a bit of theatre and only charges 60 baht ($2.40). In terms of tours and day trips, there’s lots to choose from but it’s all relatively expensive for a family of 5. 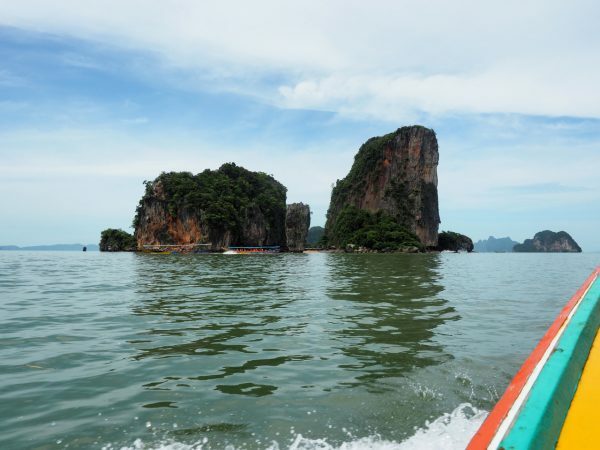 We decided to do a day tour with Green Andaman Travel that included a visit to Phang Nga Bay and James Bond Island, which cost us just over $400. 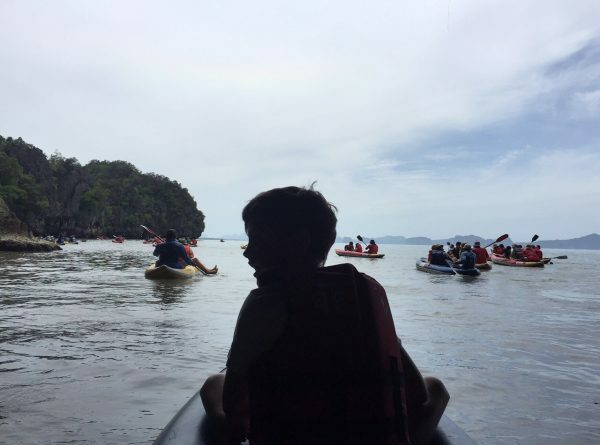 This was a fantastic day out and we loved every part of it – taking the traditional long boats through the mangroves, the sea canoes through the caves, the long boat out to James Bond Island, lunch at a floating restaurant, a walk through the markets and our visit to the Buddhist Temple on the way home. This was a fantastic day out and I’d highly recommend it. 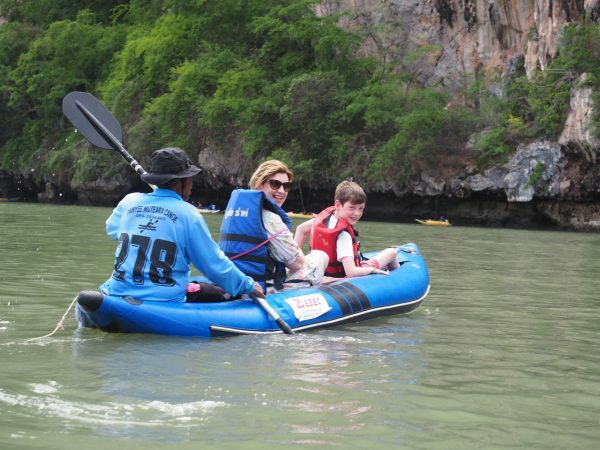 Other tours included elephant trekking, bathing and waterfall, rafting expeditions and trips to Khaosak National Park and Lake. 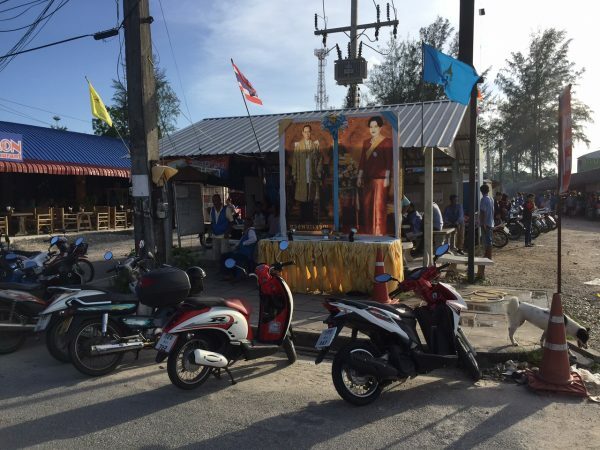 We found a similiar situation in Khao Lak as far as getting around was concerned. 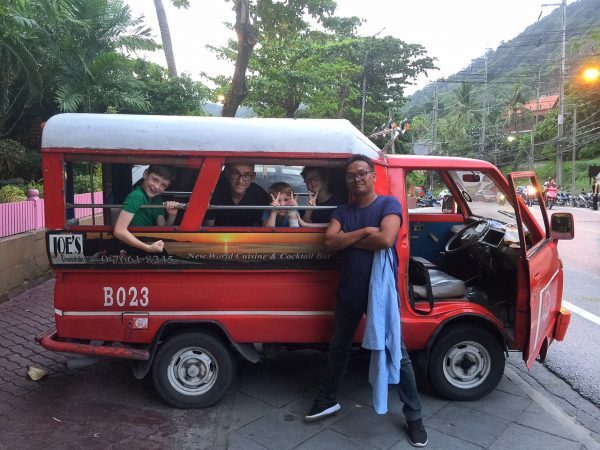 The taxis had set prices and the resort’s shuttle was expensive. Accordingly, if you can find accommodation close to the action or a tour with transfers included (as ours did), you’ll save yourself some cash. Again, we stuck to the open air vans although it did get pretty wet inside when it rained! Overall, I really enjoyed our holiday. It was much lower key than our most recent holidays, which was no doubt a good thing. 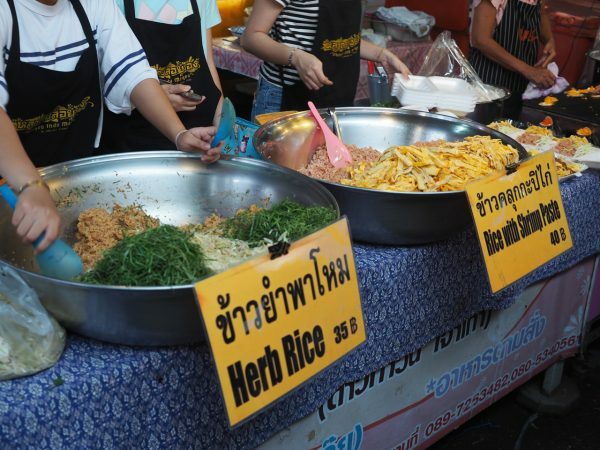 I was surprised and impressed by the incredible variety of the food. 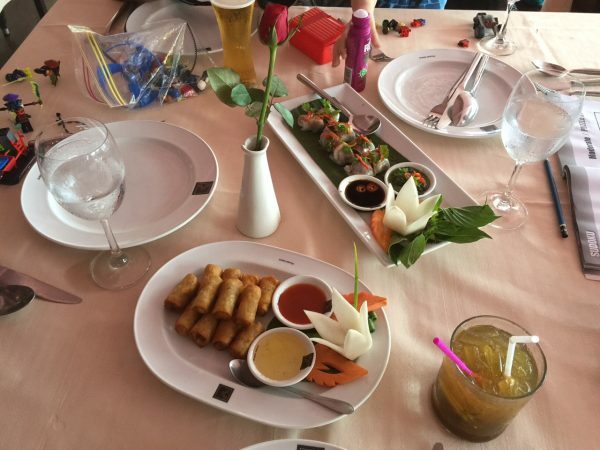 We ate so much great food and trying new dishes was one of the highlights for me. It wasn’t a cheap holiday though. 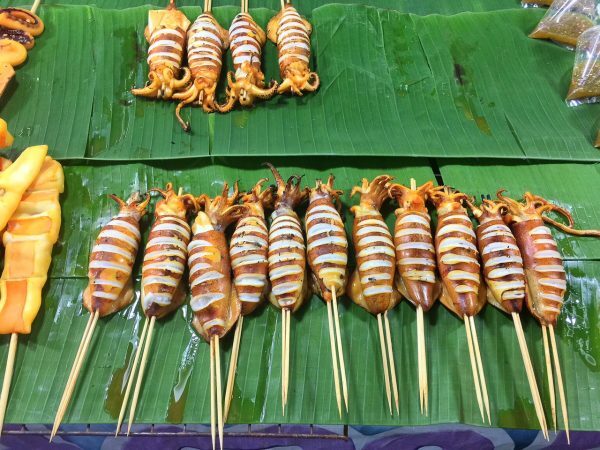 We found the price of eating out varied enormously – inside the resorts was generally double the price of eating elsewhere. It didn’t take us long to find great local places though, so I’d say overall, the food was reasonably priced. What stung was the price of taxis and activities. 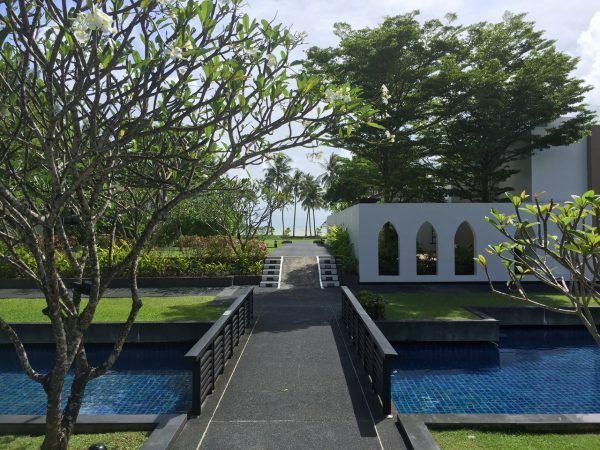 With set prices, you’re seriously slugged anytime you leave your neighbourhood (Surin Beach) or resort (Khao Lak). 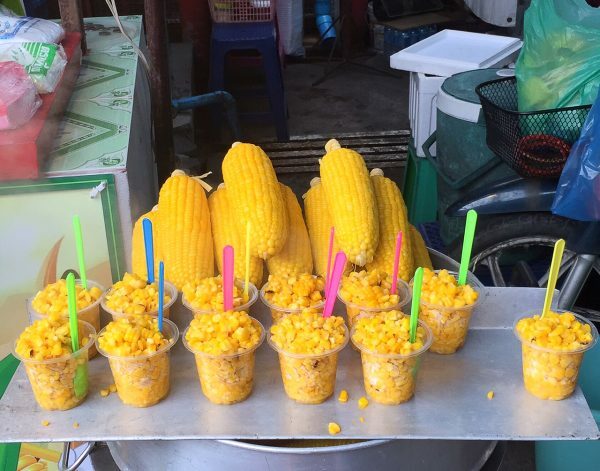 It was usually 300 Baht ($12) to go anywhere, so $24 return before you’ve done or eaten anything. 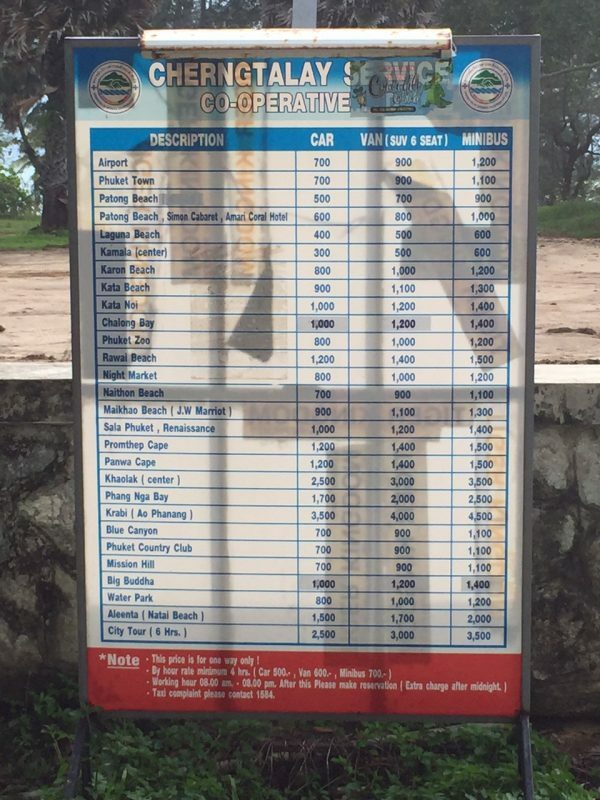 I couldn’t help compare it to Bali where the metered taxis made getting around so easy and comparatively affordable. The price of tours and attractions was up there too – most of what we looked into cost around $400 for our family of five. As a result, we only did one day trip in each location. We did find Thailand to be super family friendly though. Every cafe we ate at had an enormous menu and plenty of western options (pasta, fries, burgers) if the kids needed a break from Thai food. One of our boys had a fried egg and steamed rice nearly every night for dinner for $1.50. 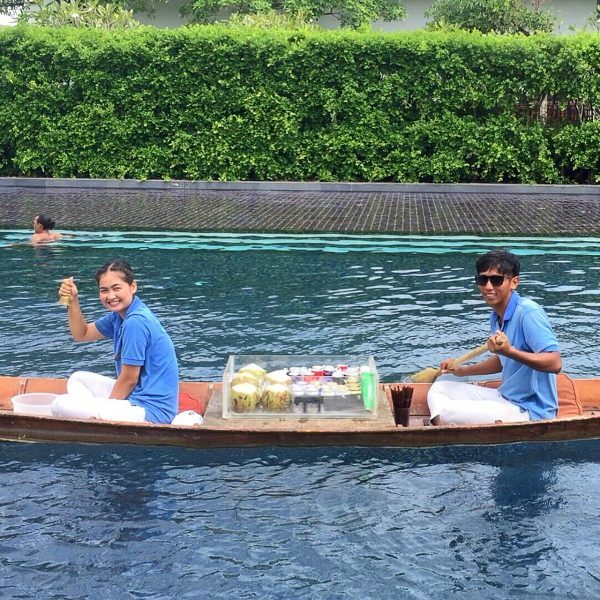 The service was always friendly and polite and we found everywhere we went welcomed children. It was an easy holiday on that front. As you can probably tell, I didn’t find Thailand to be a major shopping destination. The markets were great to visit but more from a sightseeing perspective for me. So more reading and relaxing and less shopping this time around! 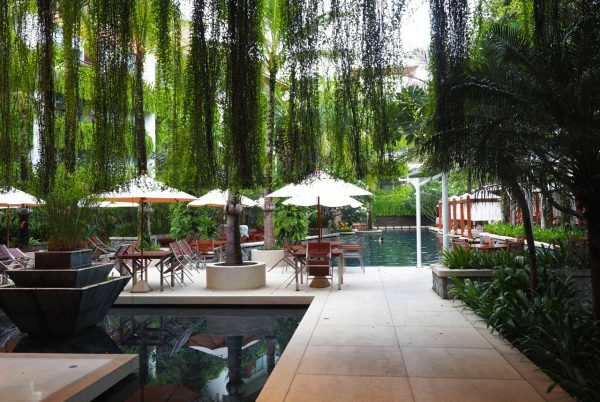 In terms of where to stay, that depends on a few things. 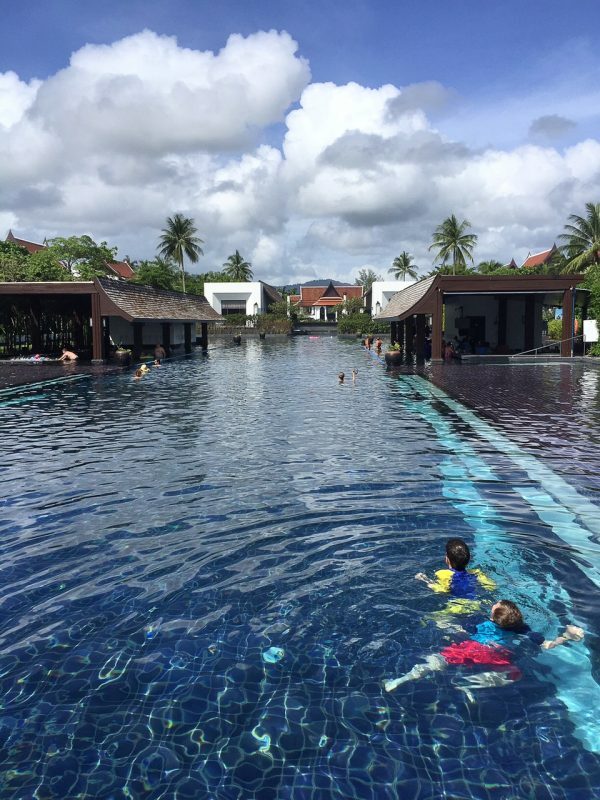 There was a lot more to do in Phuket, so if you like to have plenty of options (especially if it rains a lot), this might suit better. 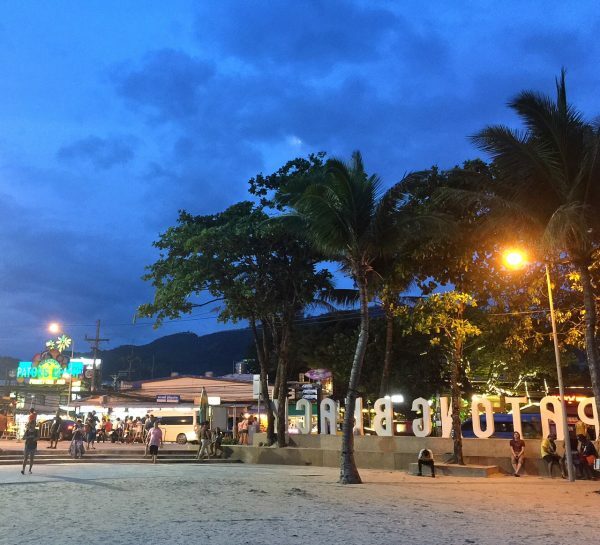 I’d just suggest staying out of Patong at one of the quieter, more family friendly beaches, such as Surin Beach, Kamala or Bang Tao. 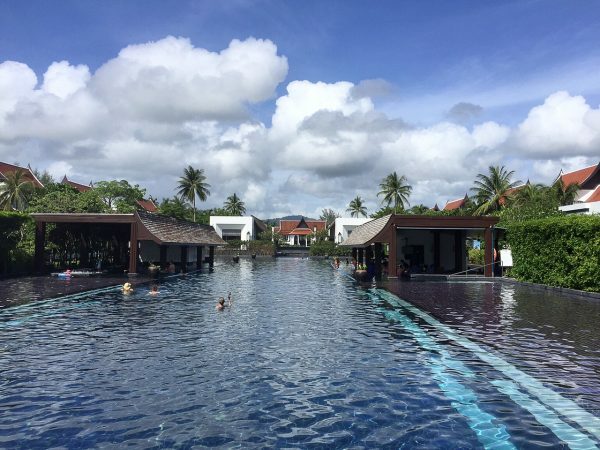 We had better weather in Khao Lak which was really lucky, so we spent nearly all our time at the pool, only venturing out for dinner most nights, into town for the market and down to Phang Nga Bay for our day trip. If it had have rained a lot during our stay, it would have been a much different experience, although at least we had the back up of kids club to give the kids a change of scenery. 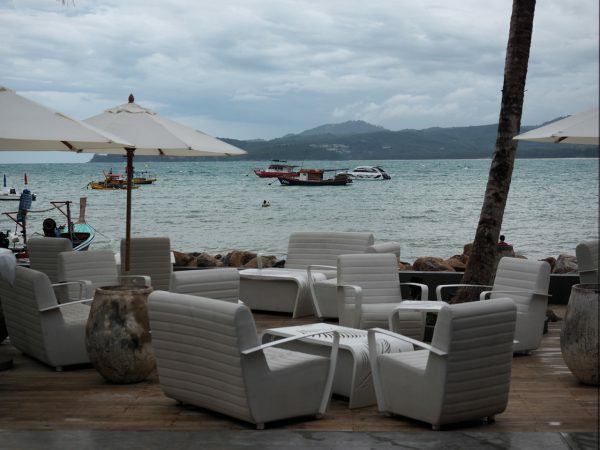 When we next return to Thailand, we would like to visit Koh Samui as we’ve heard great things. 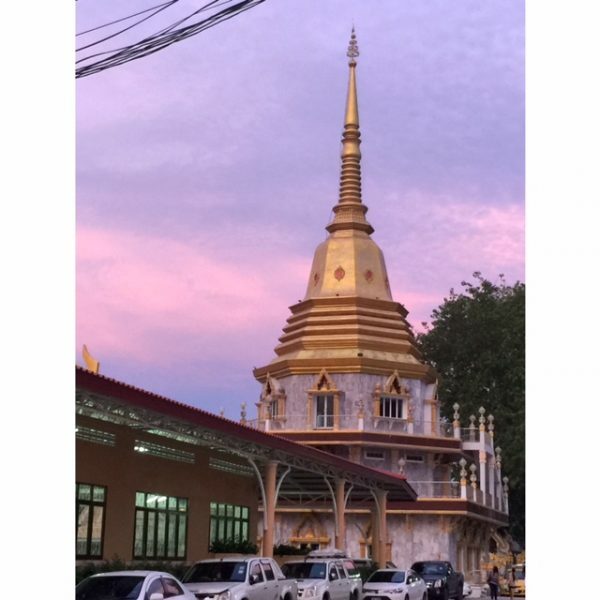 Friends have suggested it’s easiest to fly in directly via Singapore (and have a stopover) on Singapore Airlines instead of flying in to Phuket and taking an internal flight. 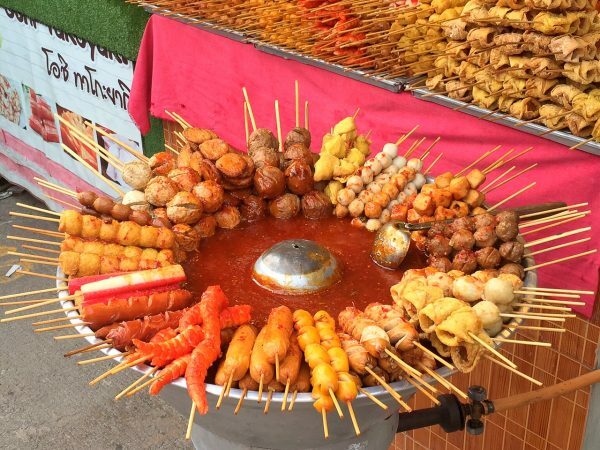 Have you visited Thailand? 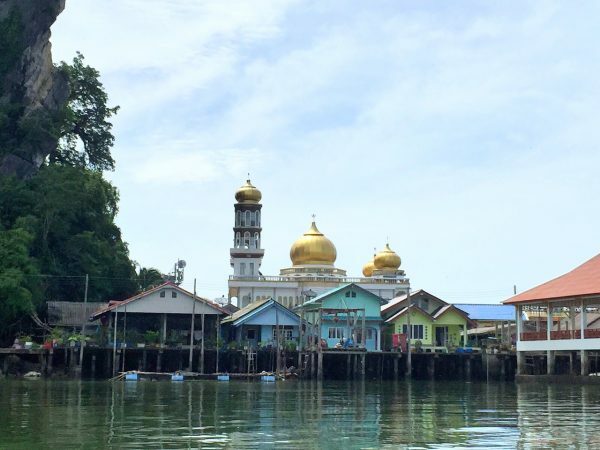 Phuket? 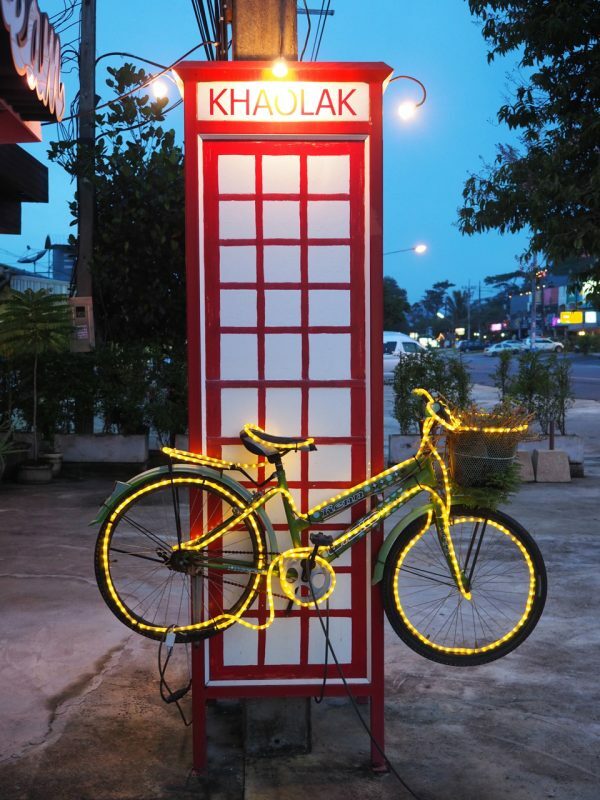 Or Khao Lak? What would you add to the above list? Where have you stayed, when have you visited and what would you recommend? 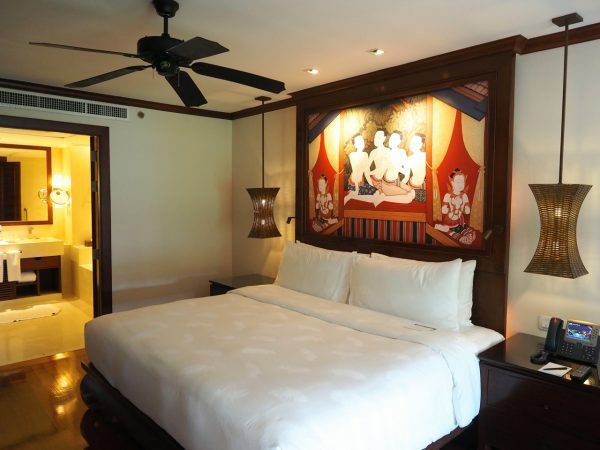 Can anyone share any Koh Samui intel?